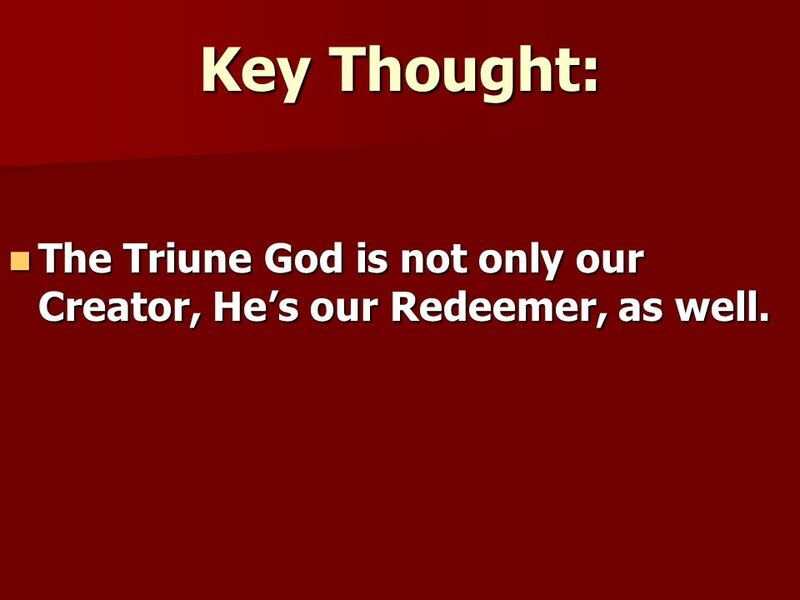 4 Key Thought: The Triune God is not only our Creator, Hes our Redeemer, as well. The Triune God is not only our Creator, Hes our Redeemer, as well. 5 Closely related to God as Creator is His role as our Redeemer. 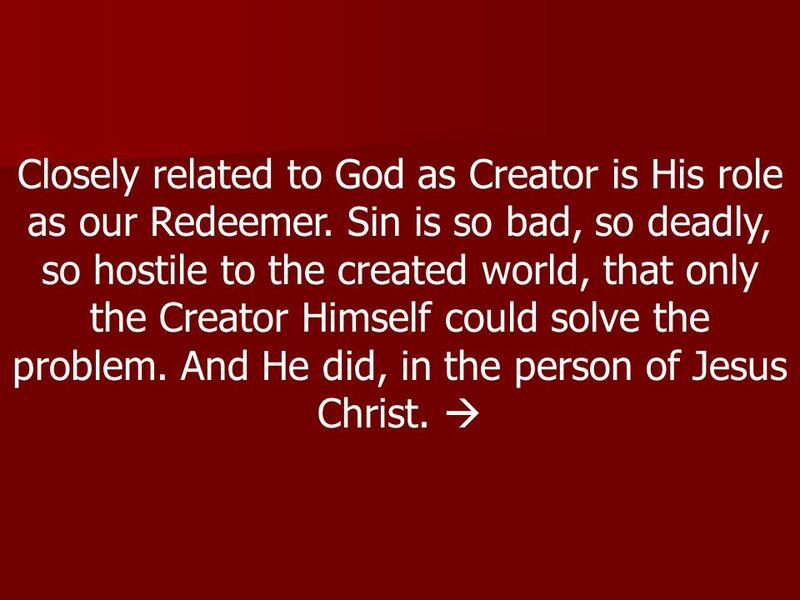 Sin is so bad, so deadly, so hostile to the created world, that only the Creator Himself could solve the problem. And He did, in the person of Jesus Christ. 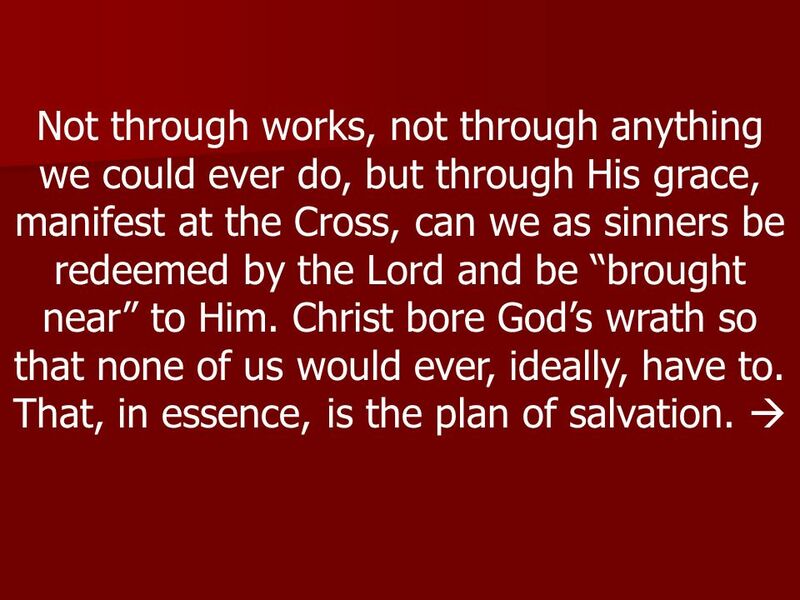 7 Not through works, not through anything we could ever do, but through His grace, manifest at the Cross, can we as sinners be redeemed by the Lord and be brought near to Him. Christ bore Gods wrath so that none of us would ever, ideally, have to. That, in essence, is the plan of salvation. 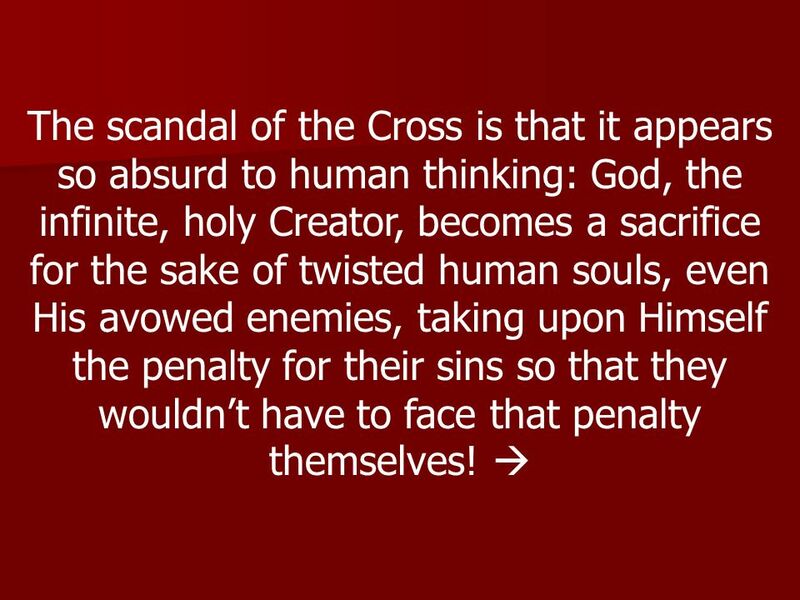 9 The scandal of the Cross is that it appears so absurd to human thinking: God, the infinite, holy Creator, becomes a sacrifice for the sake of twisted human souls, even His avowed enemies, taking upon Himself the penalty for their sins so that they wouldnt have to face that penalty themselves! 10 Hard to fathom, isnt it? 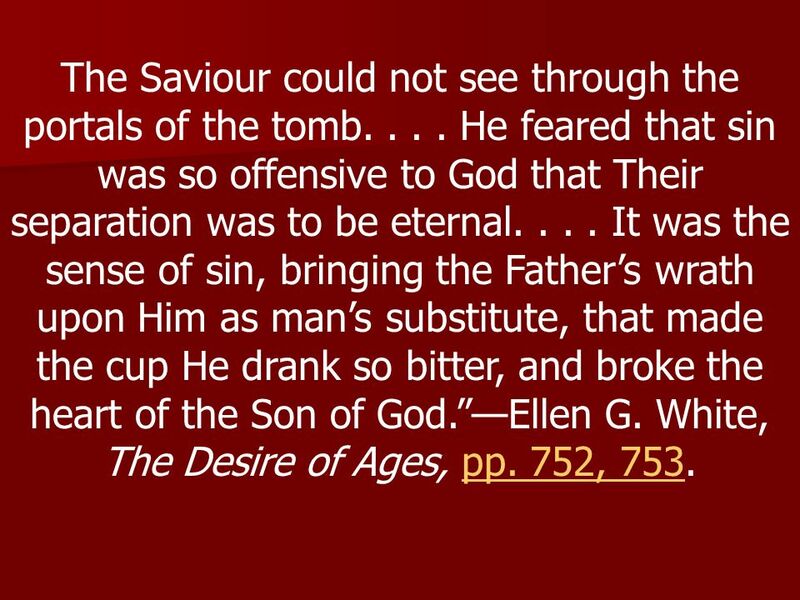 The atonement is so deep, so heavy, so profound that we grasp only what we can. 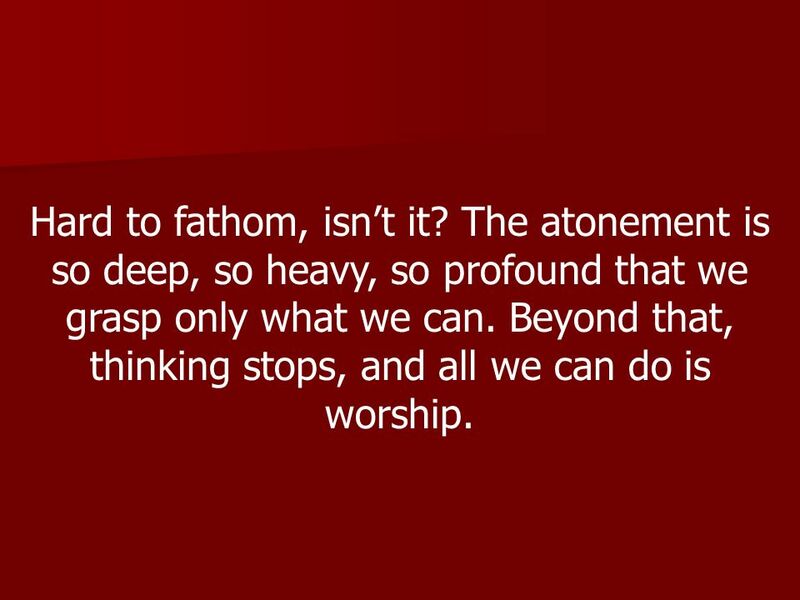 Beyond that, thinking stops, and all we can do is worship. 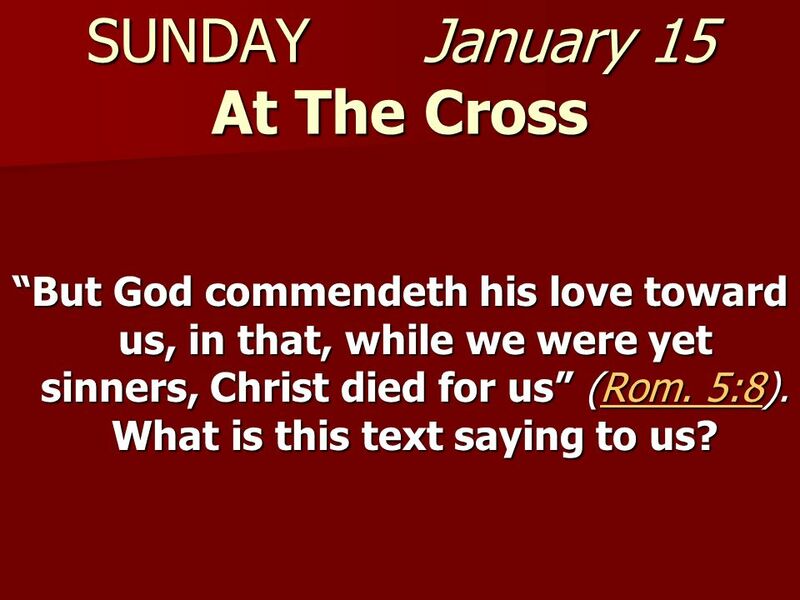 12 At the cross, in the most humiliating, inconceivable manner imaginable, God triumphs over and shames the enemy. Love, justice and compassion fuse in a singular dynamic act. 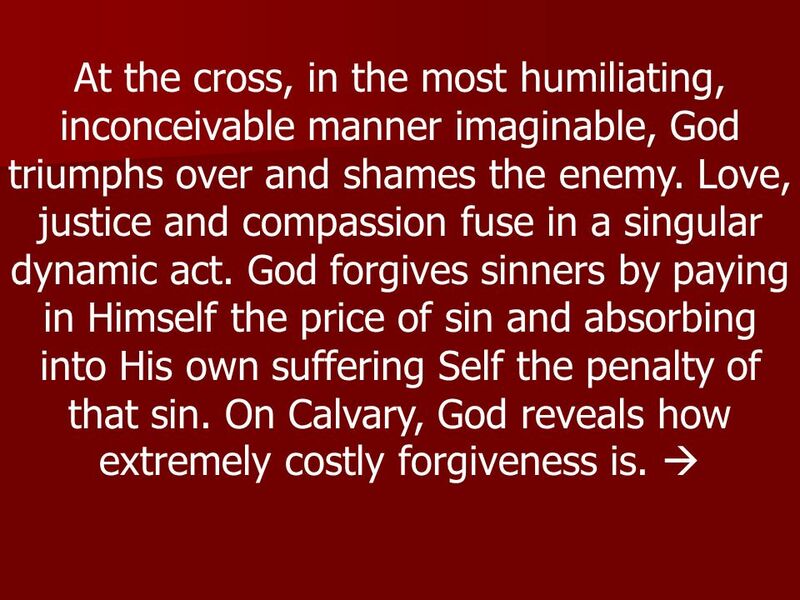 God forgives sinners by paying in Himself the price of sin and absorbing into His own suffering Self the penalty of that sin. On Calvary, God reveals how extremely costly forgiveness is. 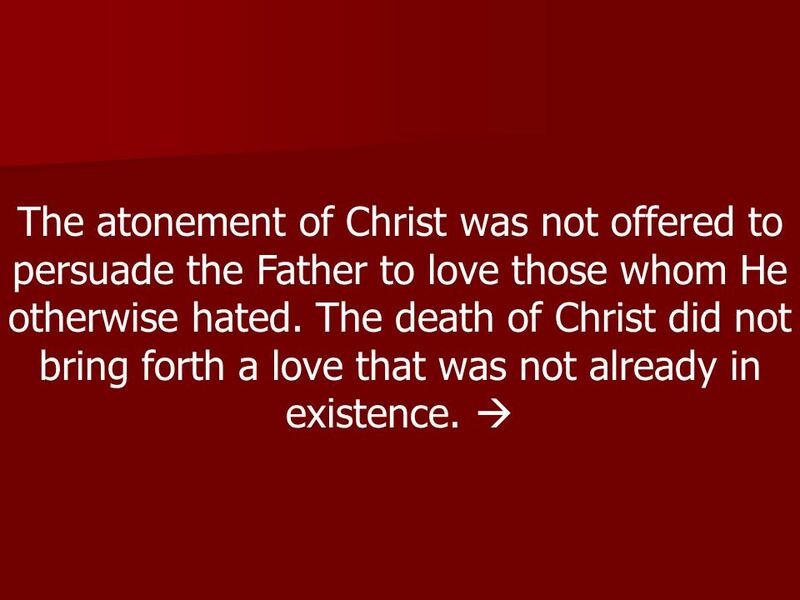 14 The atonement of Christ was not offered to persuade the Father to love those whom He otherwise hated. 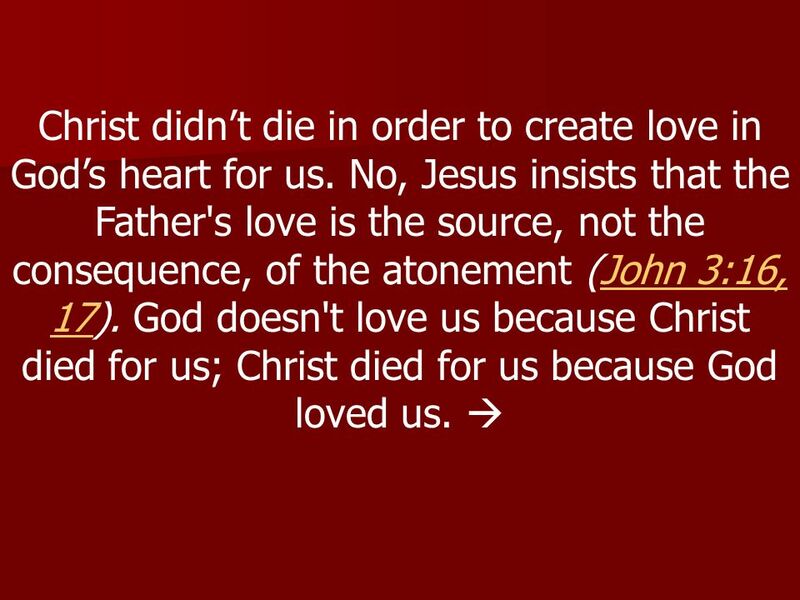 The death of Christ did not bring forth a love that was not already in existence. 16 The real tragedy is that we have lost much of the knowledge of God, against whom we have sinned. 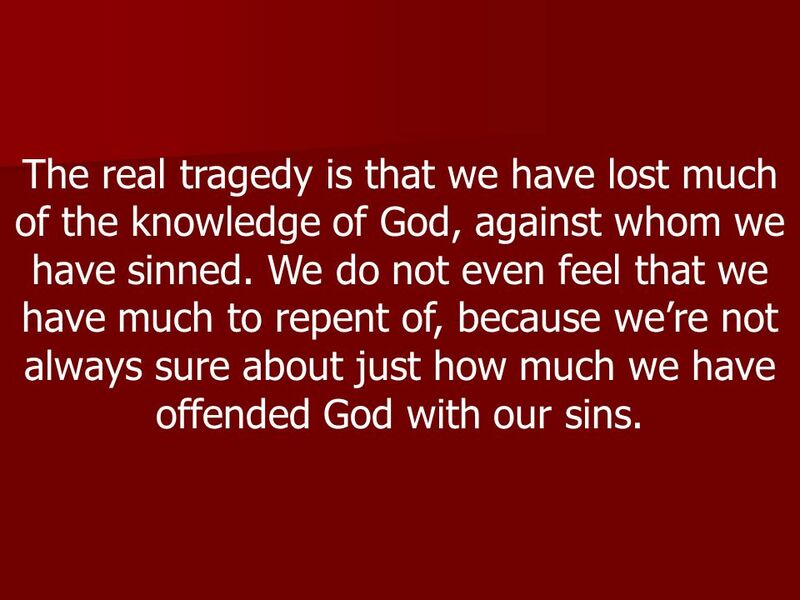 We do not even feel that we have much to repent of, because were not always sure about just how much we have offended God with our sins. 17 We can become dull to just how bad sin really is. 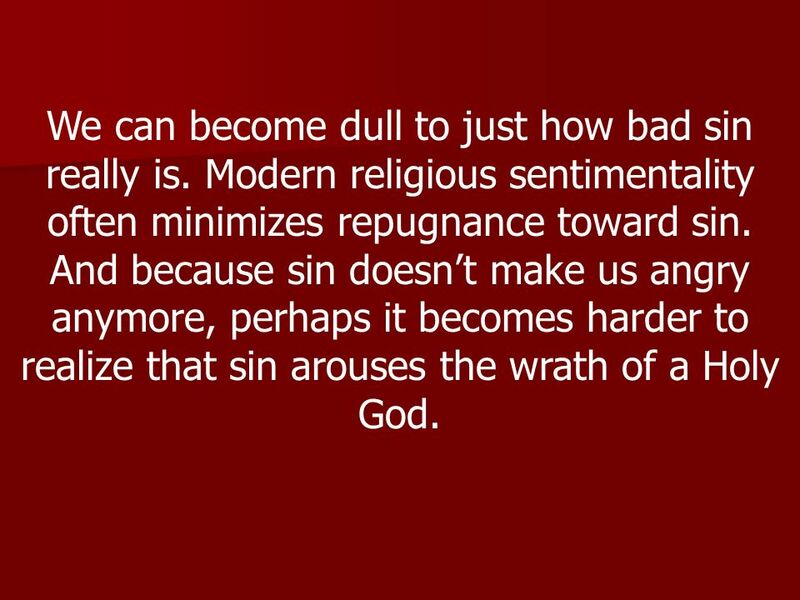 Modern religious sentimentality often minimizes repugnance toward sin. And because sin doesnt make us angry anymore, perhaps it becomes harder to realize that sin arouses the wrath of a Holy God. 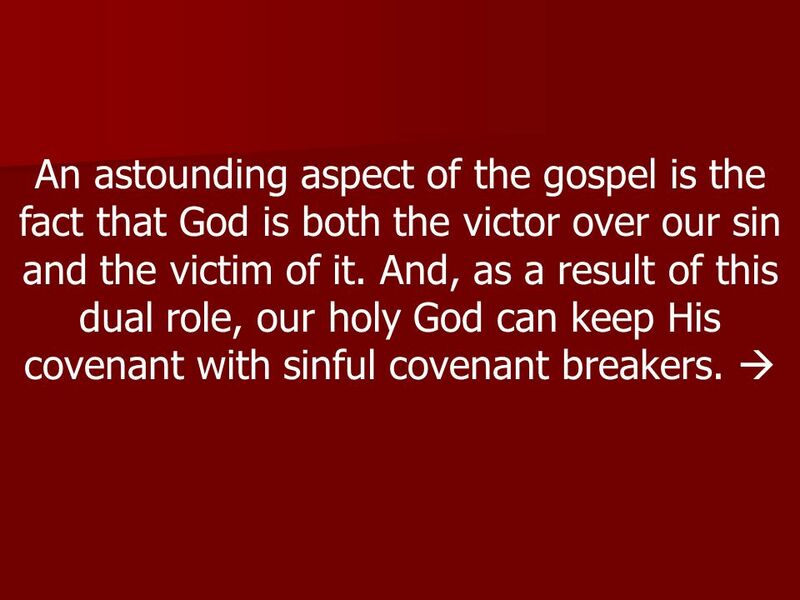 20 An astounding aspect of the gospel is the fact that God is both the victor over our sin and the victim of it. 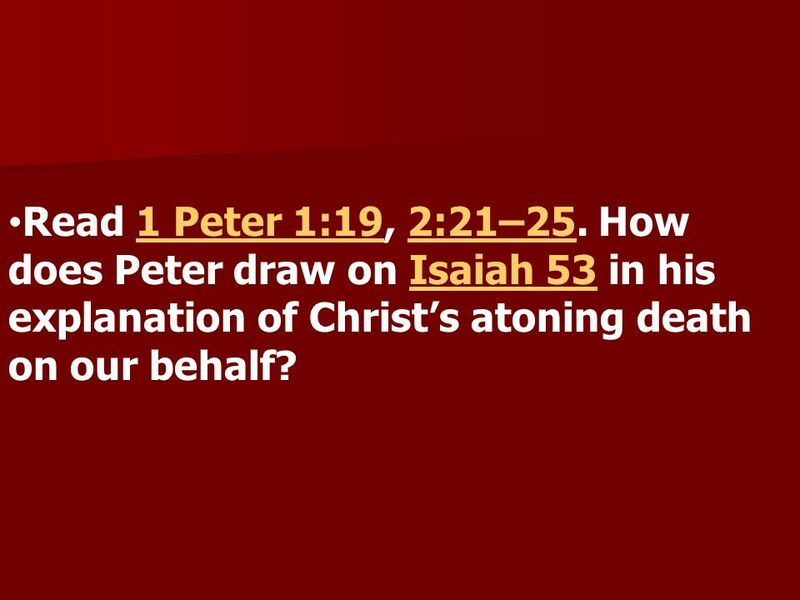 And, as a result of this dual role, our holy God can keep His covenant with sinful covenant breakers. 21 Gods love does not lead to a bland tolerance of sin and evil but to triumphing victoriously over it. 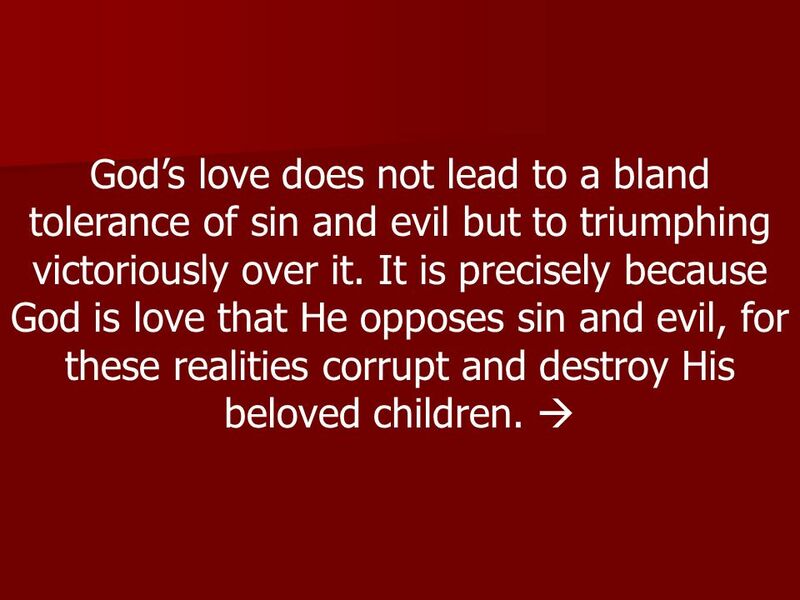 It is precisely because God is love that He opposes sin and evil, for these realities corrupt and destroy His beloved children. 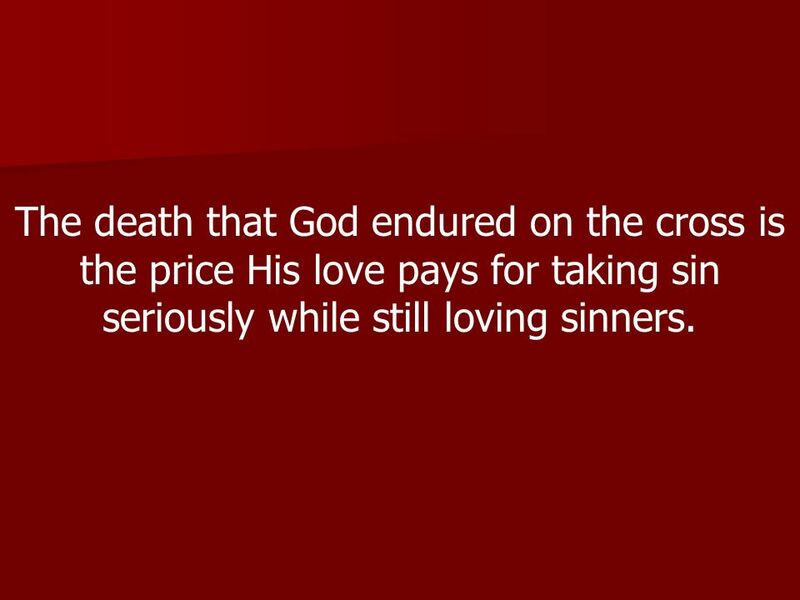 22 The death that God endured on the cross is the price His love pays for taking sin seriously while still loving sinners. 23 How seriously do you take the sin in your life? And what criteria do you use to justify your answer? 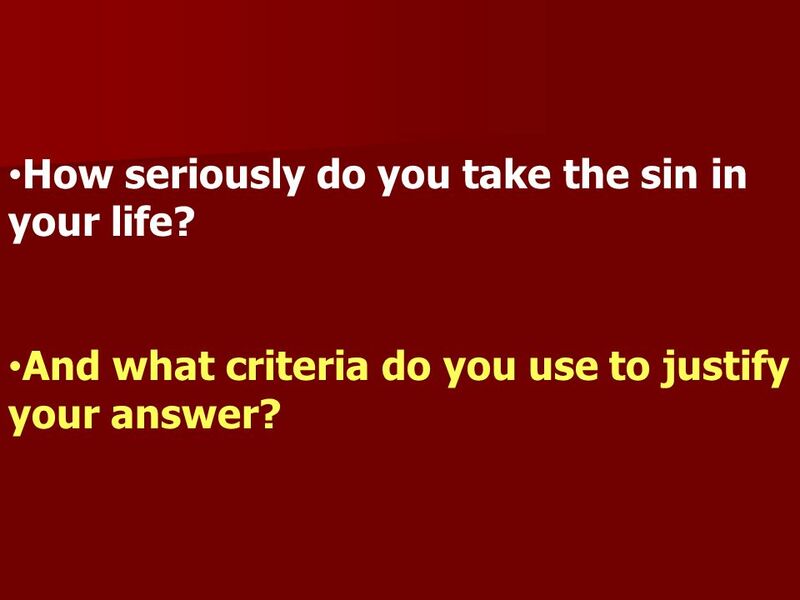 24 How seriously do you take the sin in your life? And what criteria do you use to justify your answer? 26 The language here is striking. Adam and Eve have sinned. 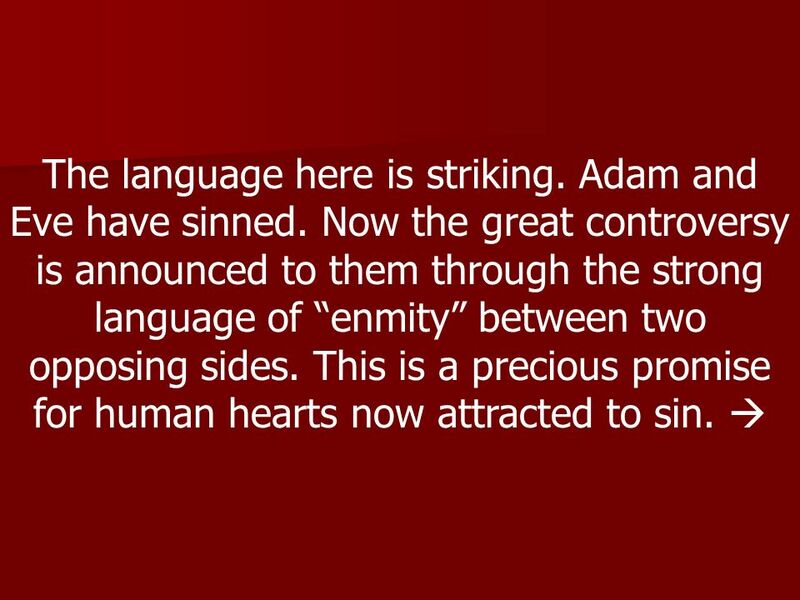 Now the great controversy is announced to them through the strong language of enmity between two opposing sides. 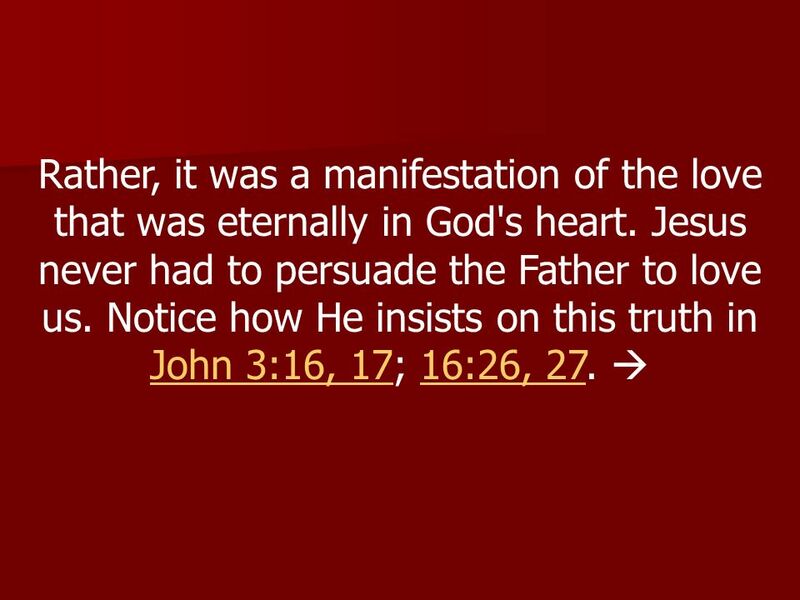 This is a precious promise for human hearts now attracted to sin. 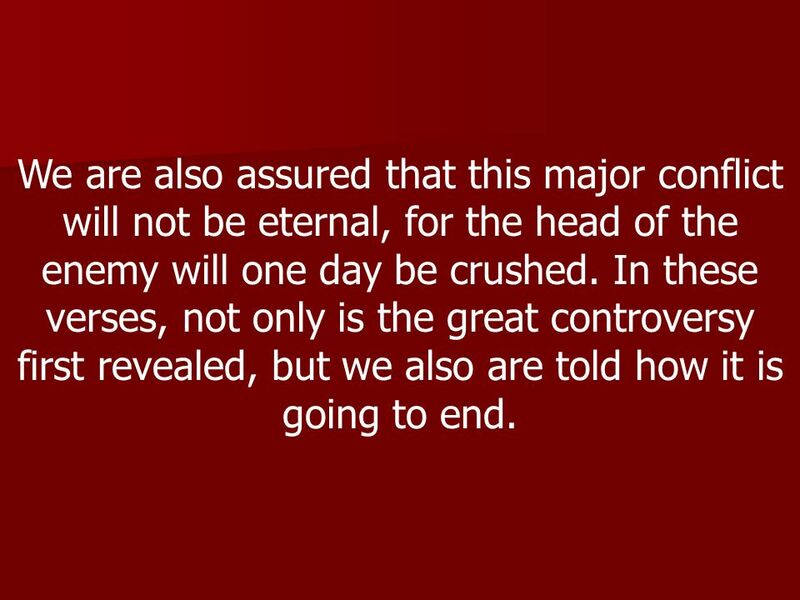 27 We are also assured that this major conflict will not be eternal, for the head of the enemy will one day be crushed. 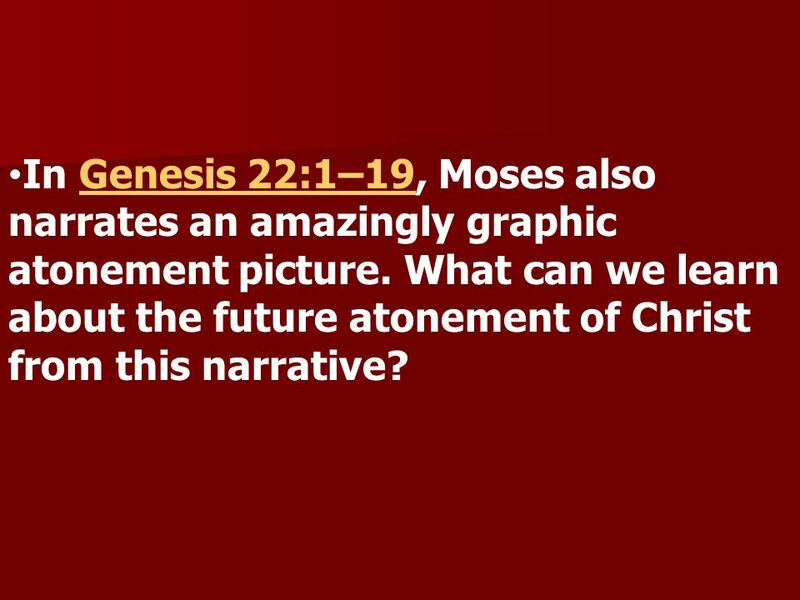 In these verses, not only is the great controversy first revealed, but we also are told how it is going to end. 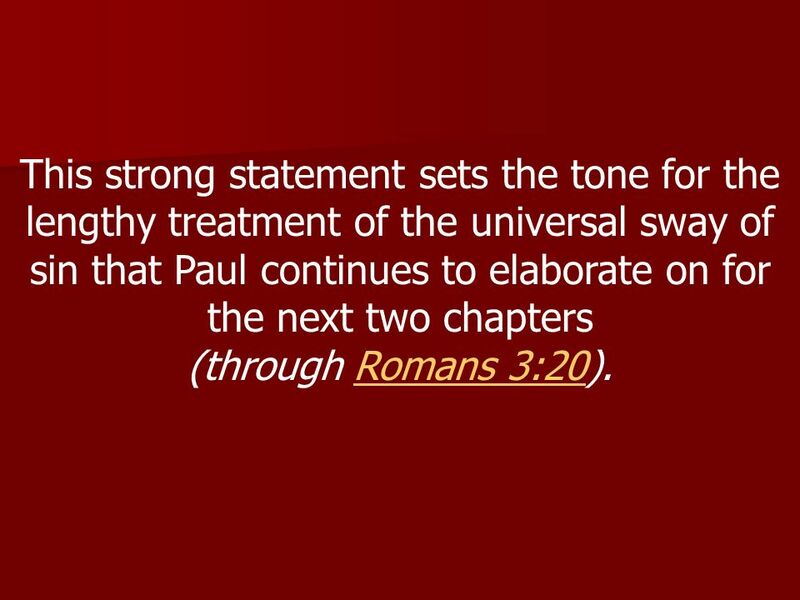 28 Paul took courage from Genesis 3:15. How does he express it in Romans 16:20?Genesis 3:15Romans 16:20 What point is he making? 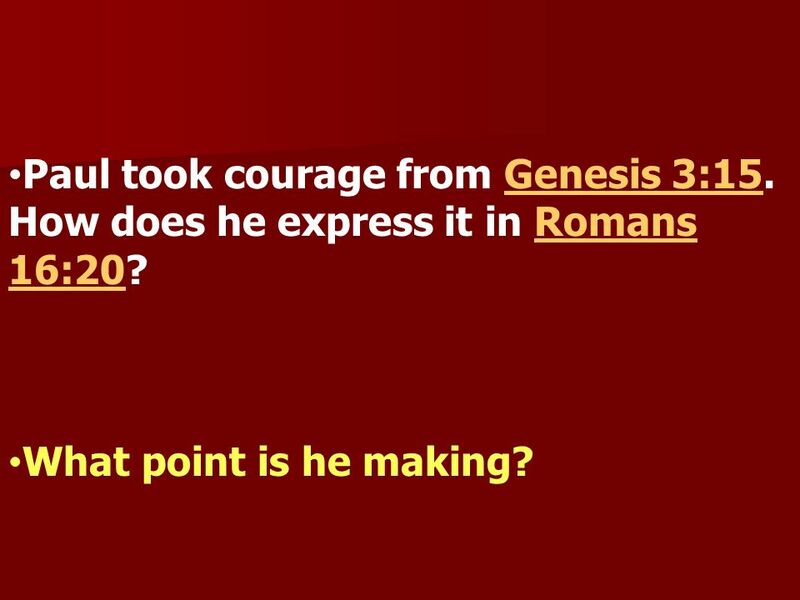 29 Paul took courage from Genesis 3:15. 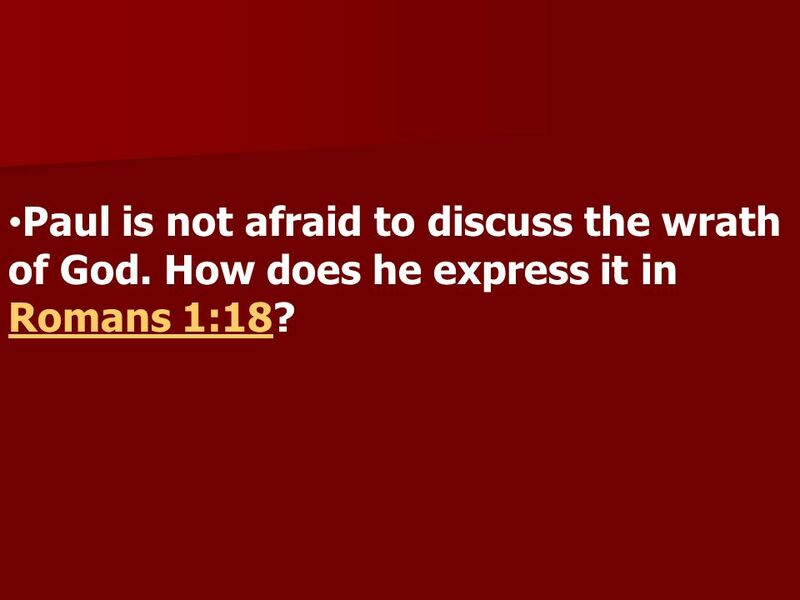 How does he express it in Romans 16:20?Genesis 3:15Romans 16:20 What point is he making? 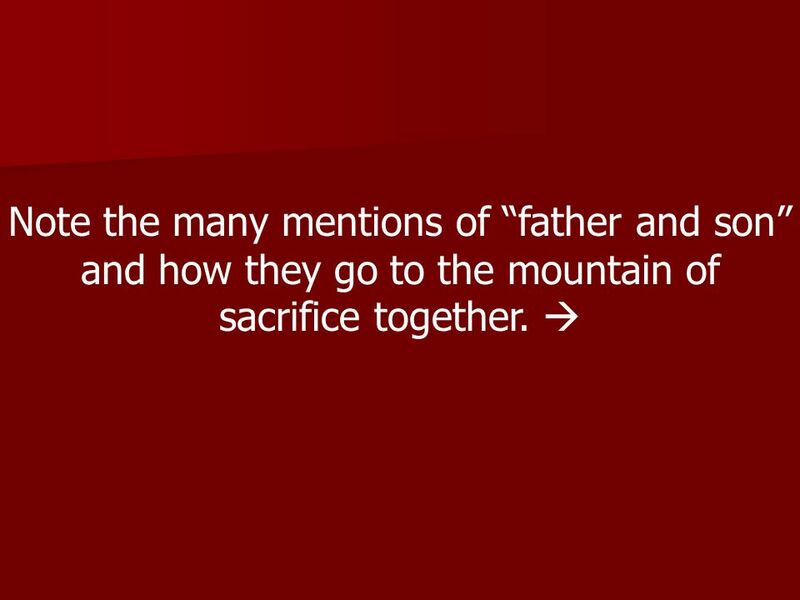 31 Note the many mentions of father and son and how they go to the mountain of sacrifice together. 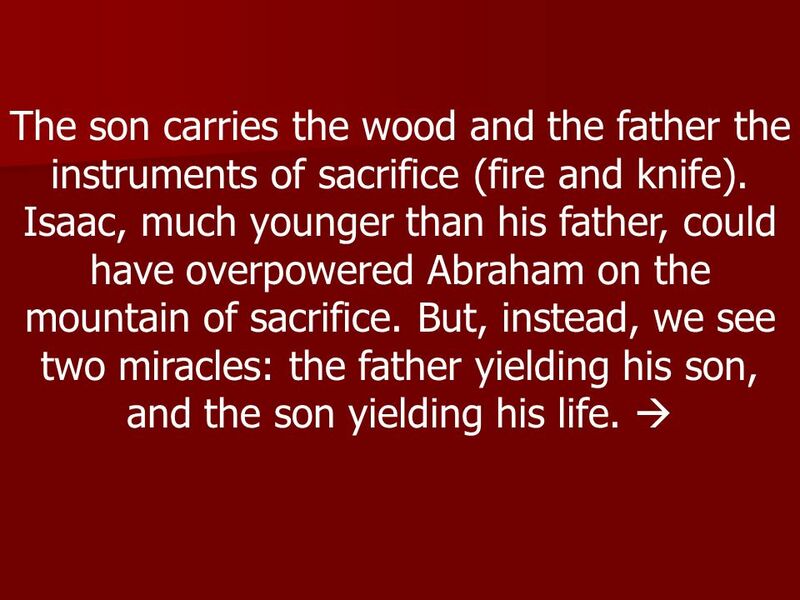 32 The son carries the wood and the father the instruments of sacrifice (fire and knife). 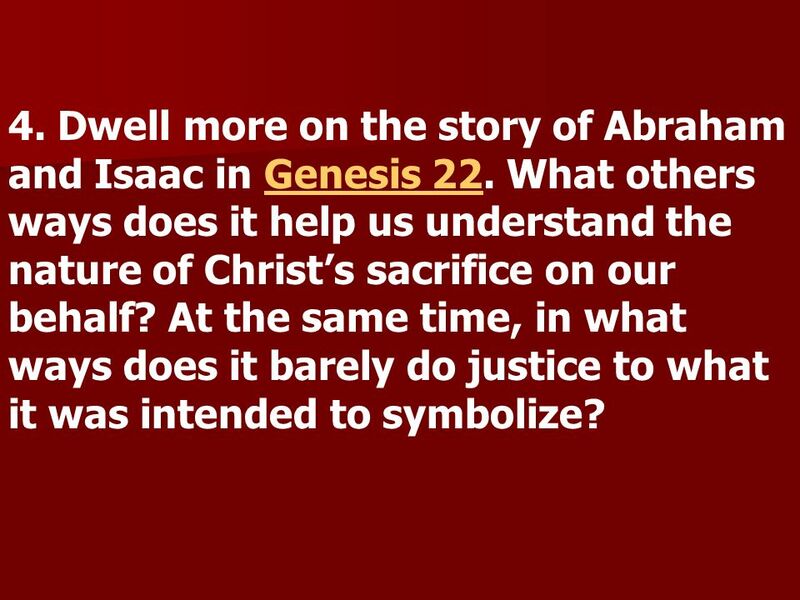 Isaac, much younger than his father, could have overpowered Abraham on the mountain of sacrifice. But, instead, we see two miracles: the father yielding his son, and the son yielding his life. 33 What a powerful representation of the sacrificial death of Christ on our behalf. The scene, however powerful and moving, was only a tiny foretaste of the time when centuries later another Father would offer His Son. 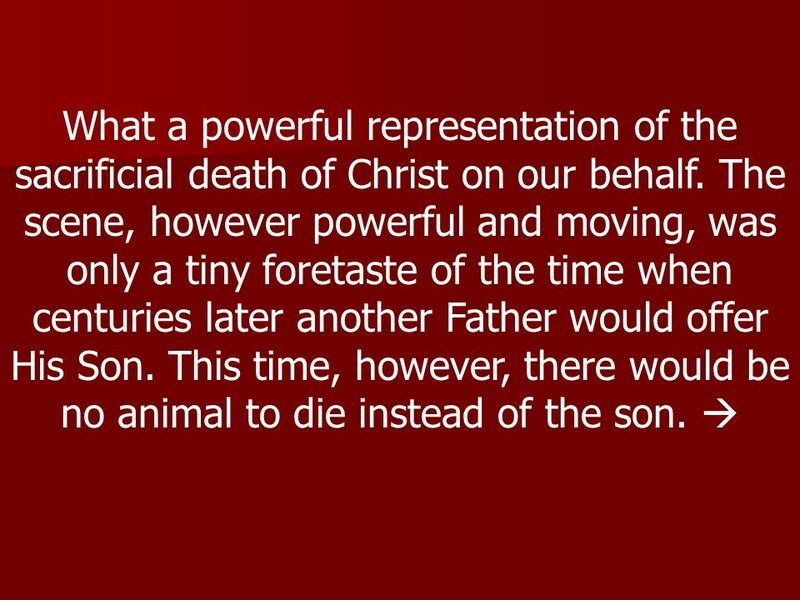 This time, however, there would be no animal to die instead of the son. 34 The Son Himself would die on the altar. 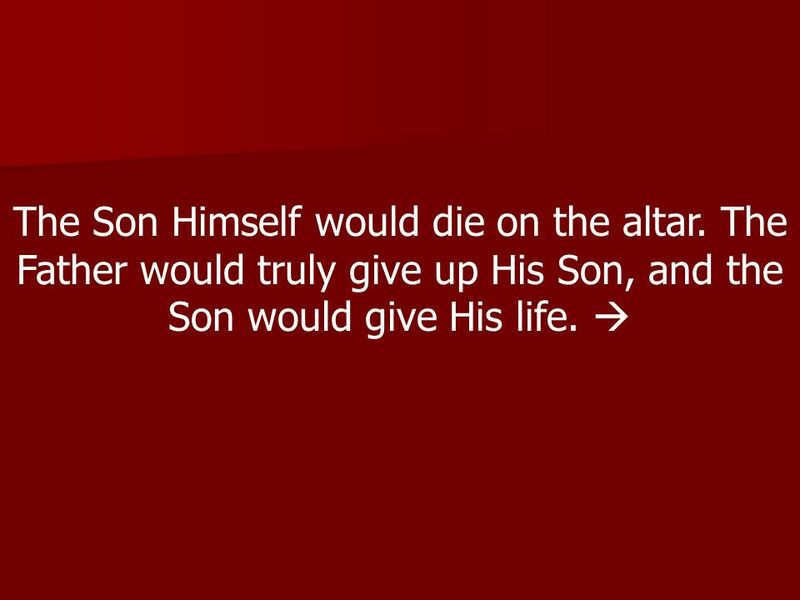 The Father would truly give up His Son, and the Son would give His life. 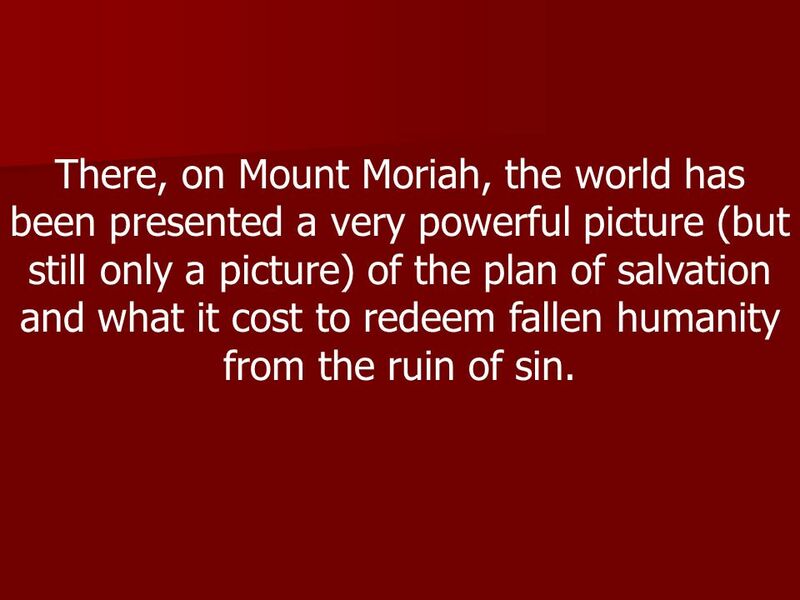 35 There, on Mount Moriah, the world has been presented a very powerful picture (but still only a picture) of the plan of salvation and what it cost to redeem fallen humanity from the ruin of sin. 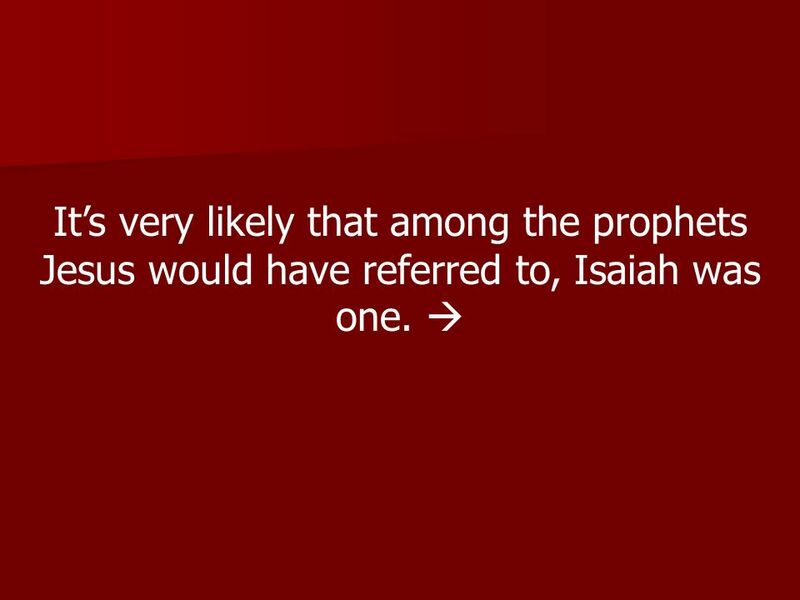 37 Its very likely that among the prophets Jesus would have referred to, Isaiah was one. 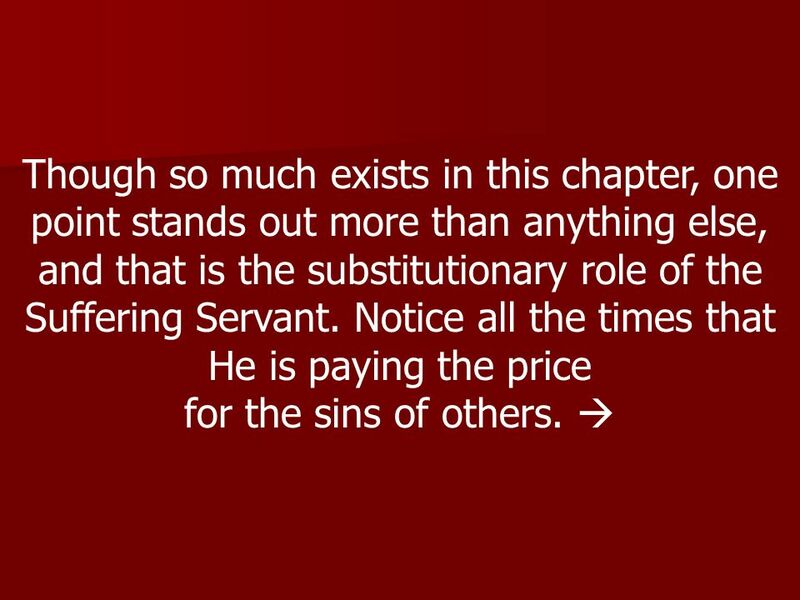 39 Though so much exists in this chapter, one point stands out more than anything else, and that is the substitutionary role of the Suffering Servant. Notice all the times that He is paying the price for the sins of others. 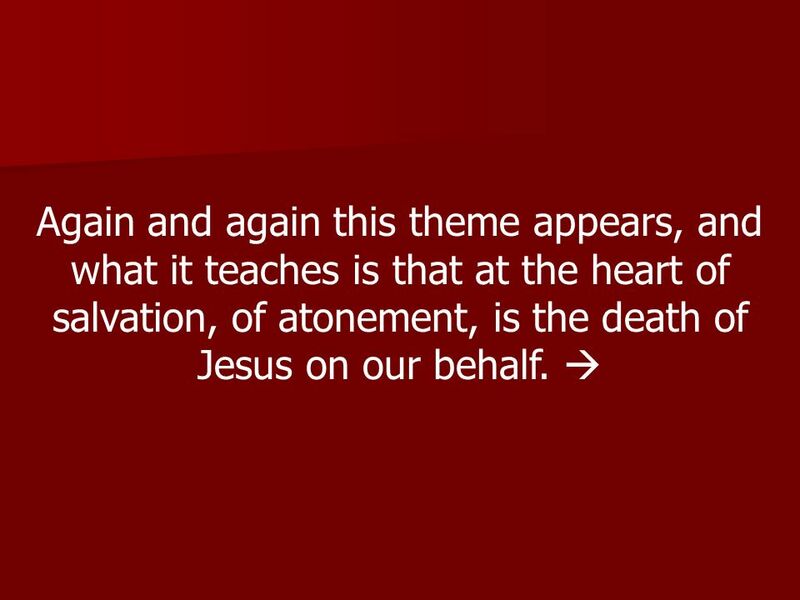 40 Again and again this theme appears, and what it teaches is that at the heart of salvation, of atonement, is the death of Jesus on our behalf. 41 As sinners who have violated Gods law; we can do nothing to make ourselves right with God. 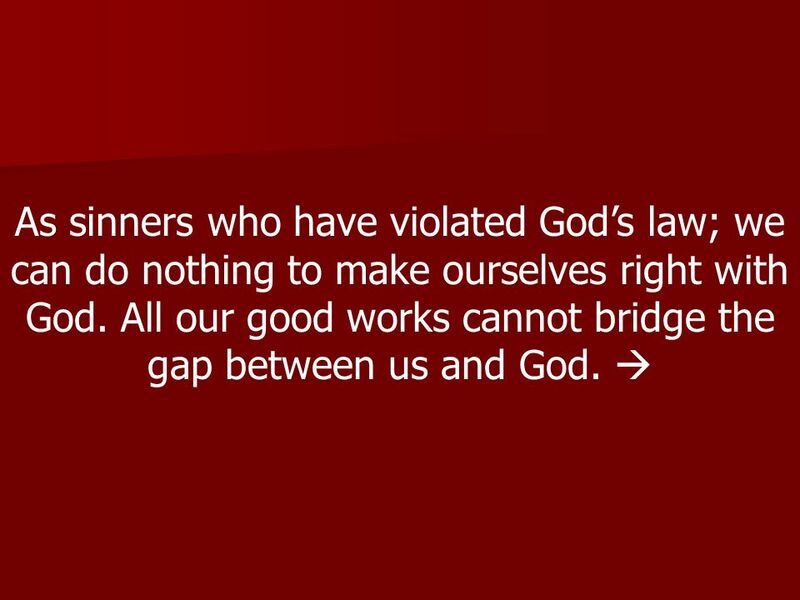 All our good works cannot bridge the gap between us and God. 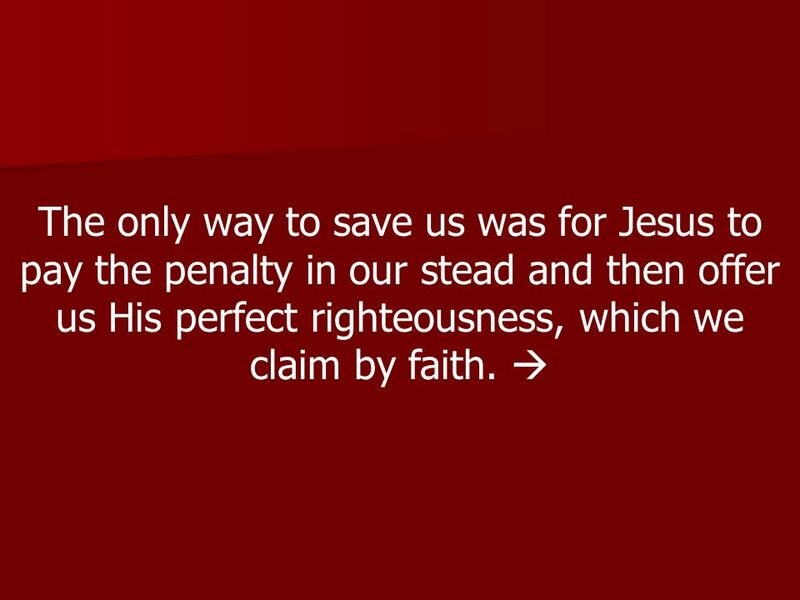 42 The only way to save us was for Jesus to pay the penalty in our stead and then offer us His perfect righteousness, which we claim by faith. 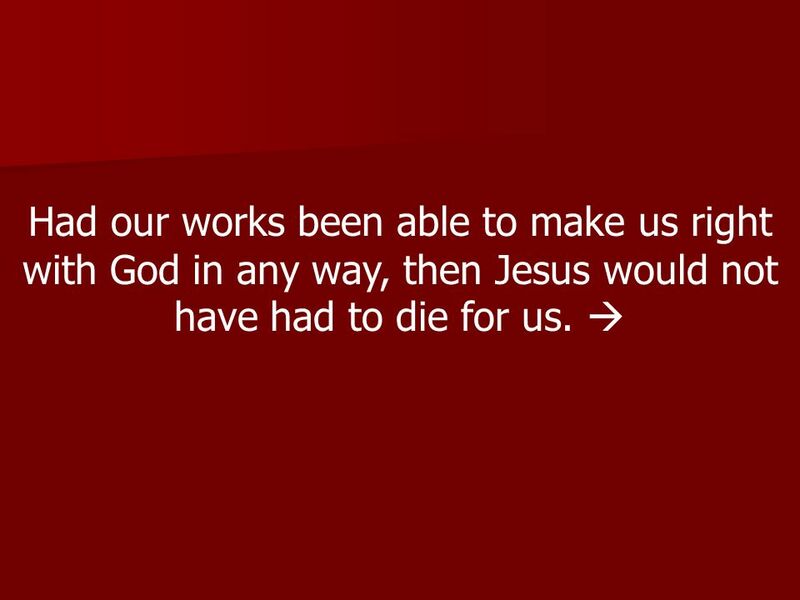 43 Had our works been able to make us right with God in any way, then Jesus would not have had to die for us. 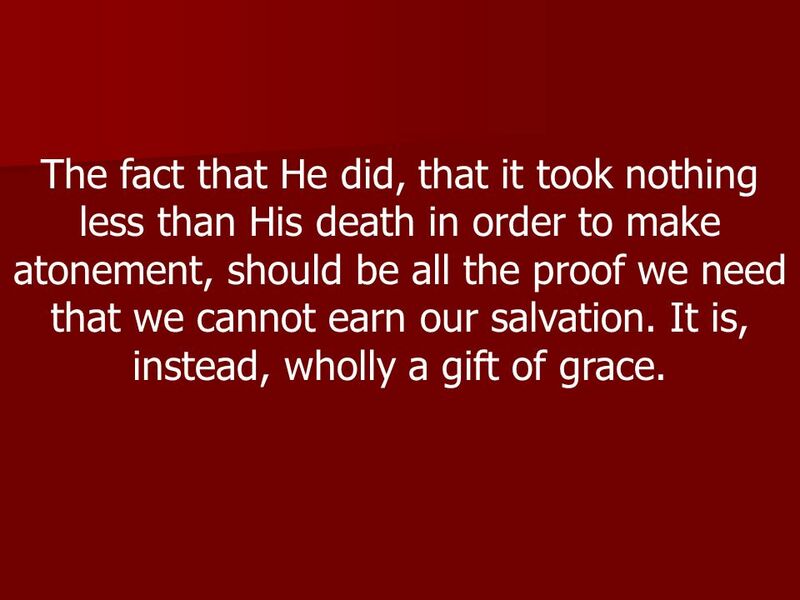 44 The fact that He did, that it took nothing less than His death in order to make atonement, should be all the proof we need that we cannot earn our salvation. It is, instead, wholly a gift of grace. 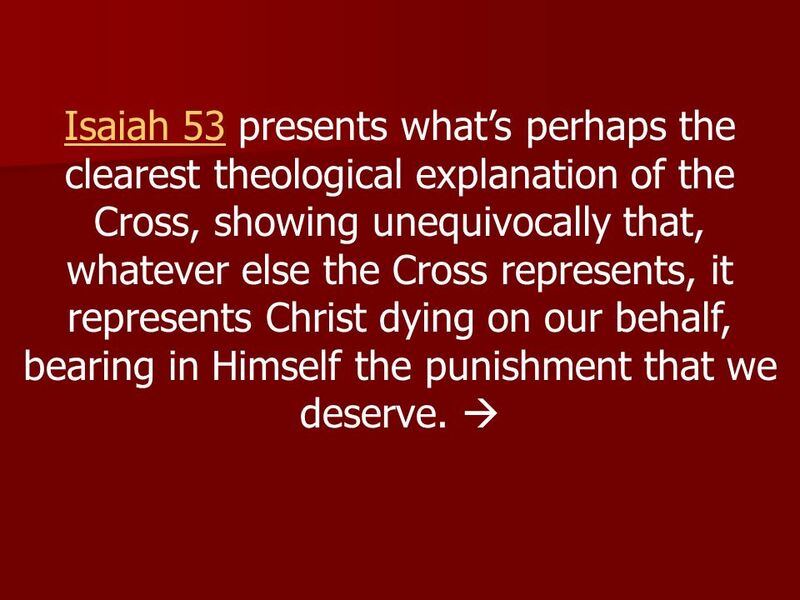 46 Isaiah 53 presents whats perhaps the clearest theological explanation of the Cross, showing unequivocally that, whatever else the Cross represents, it represents Christ dying on our behalf, bearing in Himself the punishment that we deserve. 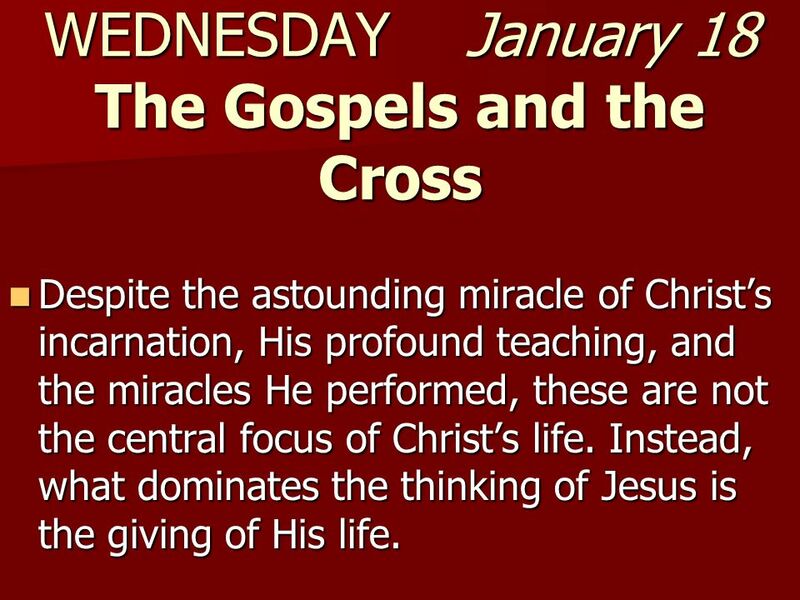 48 WEDNESDAY January 18 The Gospels and the Cross Despite the astounding miracle of Christs incarnation, His profound teaching, and the miracles He performed, these are not the central focus of Christs life. Instead, what dominates the thinking of Jesus is the giving of His life. 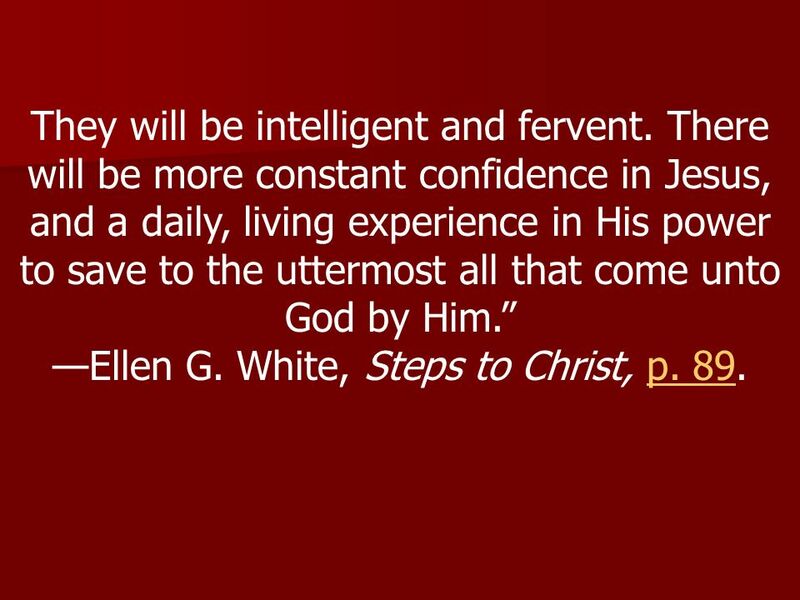 Despite the astounding miracle of Christs incarnation, His profound teaching, and the miracles He performed, these are not the central focus of Christs life. Instead, what dominates the thinking of Jesus is the giving of His life. 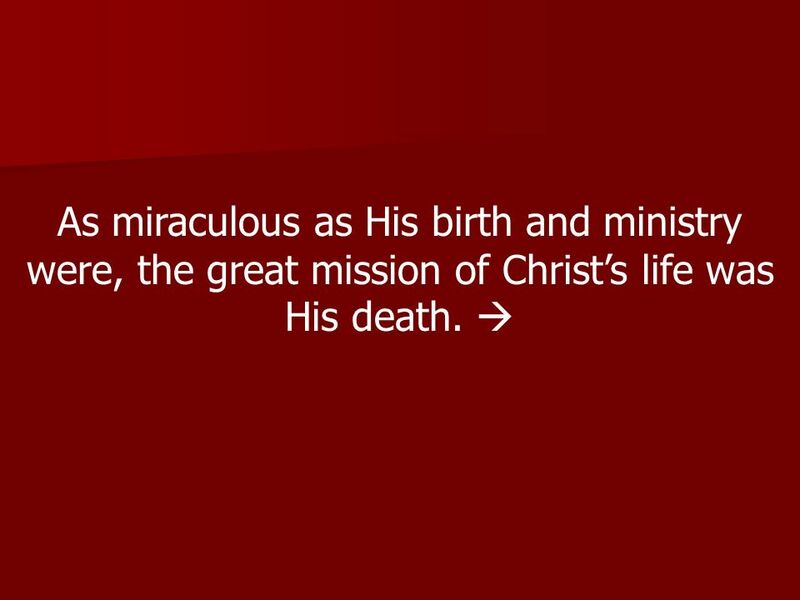 49 As miraculous as His birth and ministry were, the great mission of Christs life was His death. 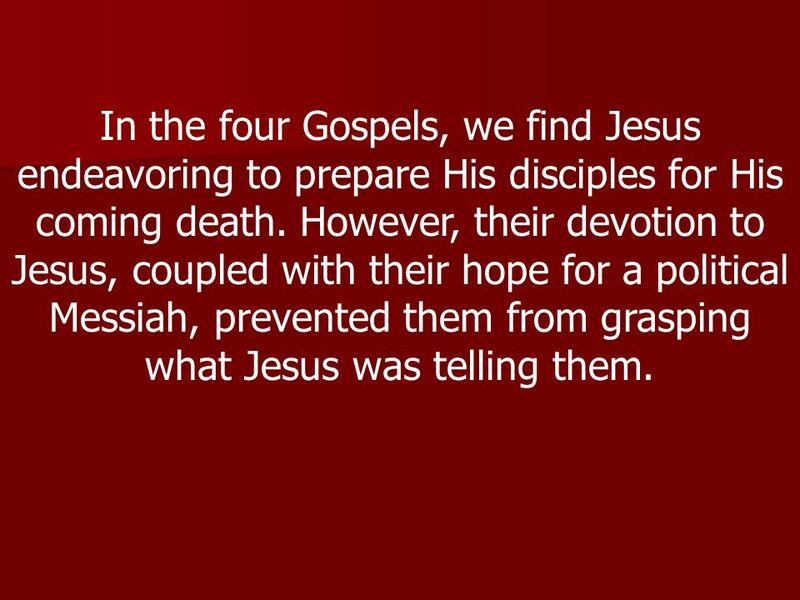 50 In the four Gospels, we find Jesus endeavoring to prepare His disciples for His coming death. 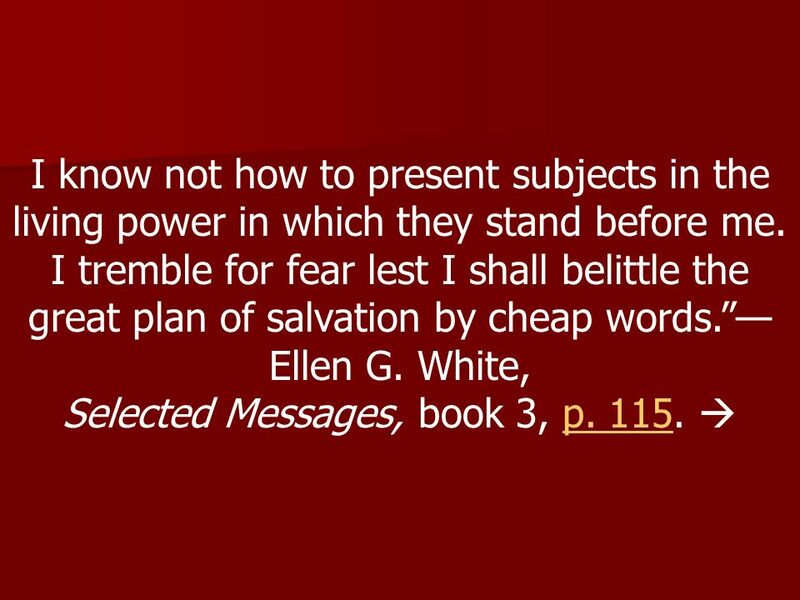 However, their devotion to Jesus, coupled with their hope for a political Messiah, prevented them from grasping what Jesus was telling them. 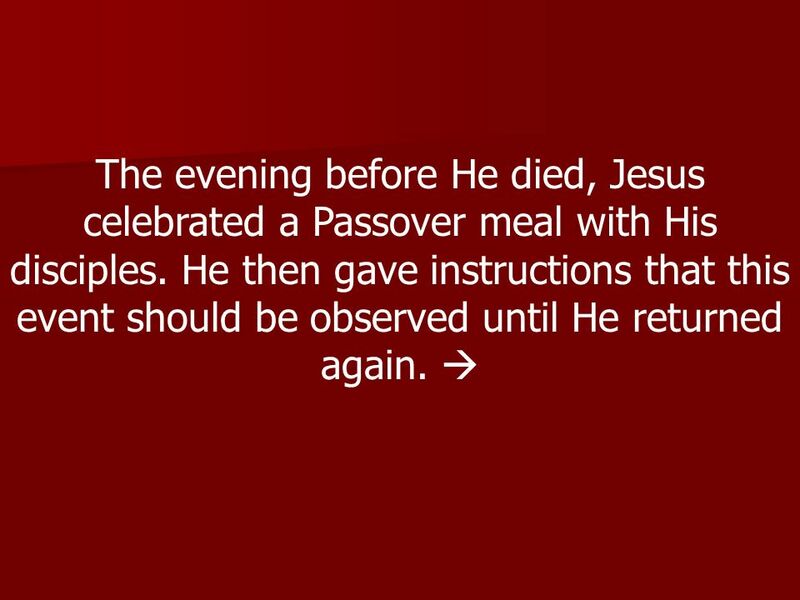 54 The evening before He died, Jesus celebrated a Passover meal with His disciples. He then gave instructions that this event should be observed until He returned again. 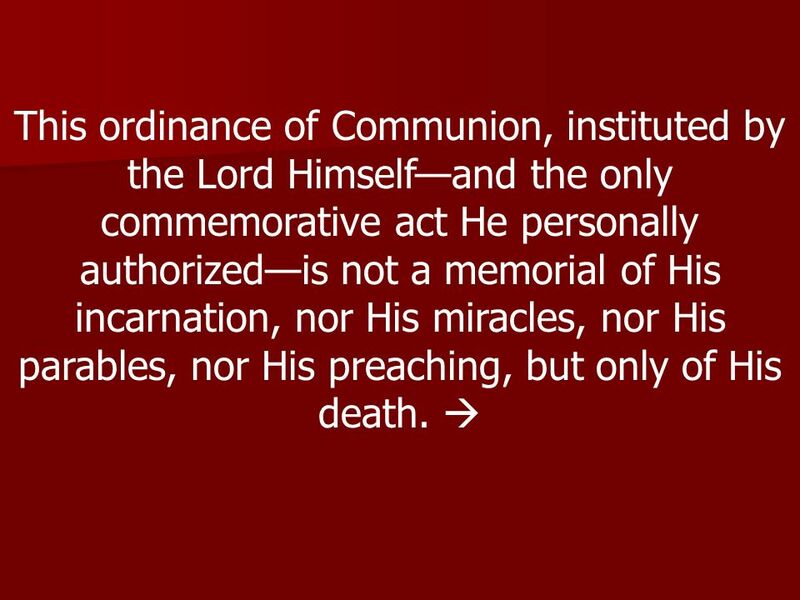 55 This ordinance of Communion, instituted by the Lord Himselfand the only commemorative act He personally authorizedis not a memorial of His incarnation, nor His miracles, nor His parables, nor His preaching, but only of His death. 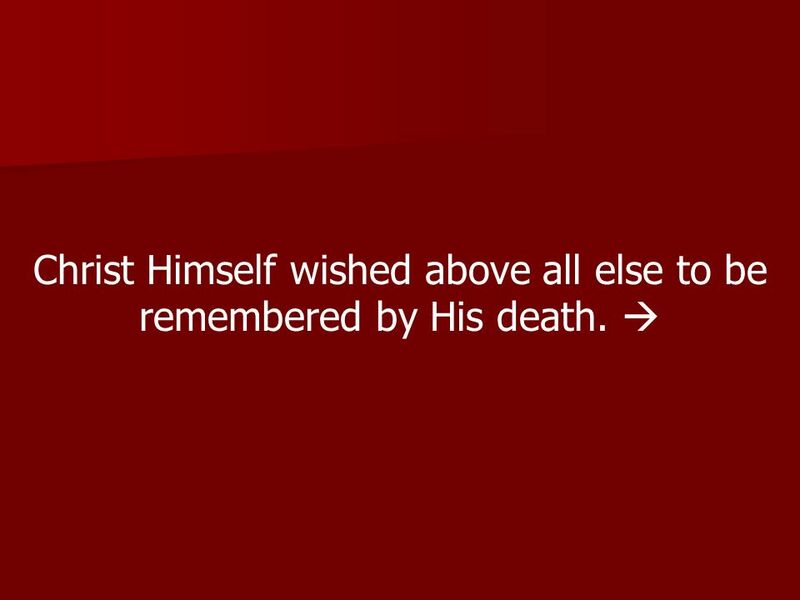 56 Christ Himself wished above all else to be remembered by His death. 57 In fact, in the four Gospel accounts of the Messiahs life, the events surrounding and including the crucifixion carry the major emphasis. 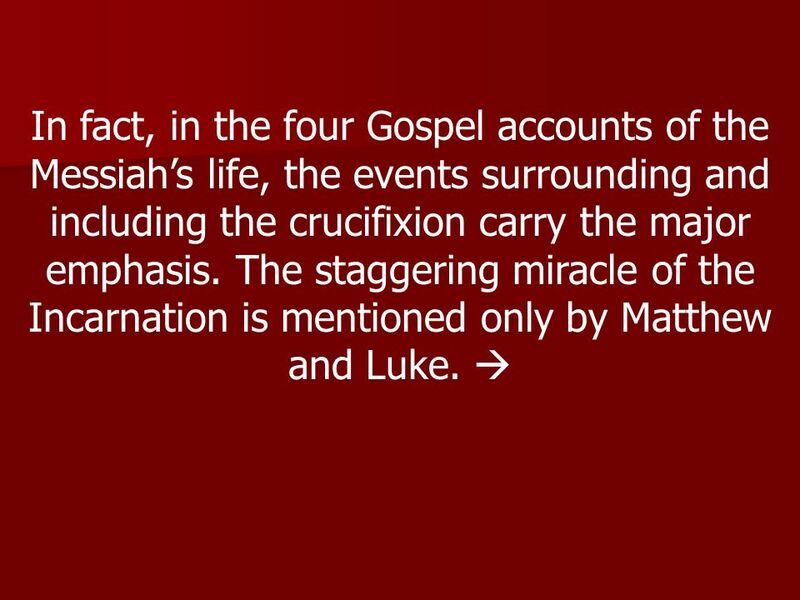 The staggering miracle of the Incarnation is mentioned only by Matthew and Luke. 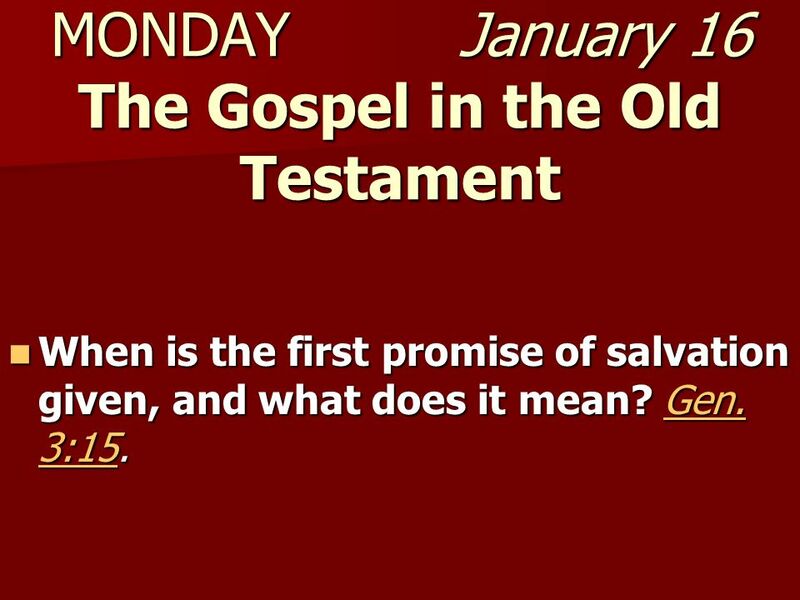 58 Only two chapters in each of their Gospels record Christs conception and birth. 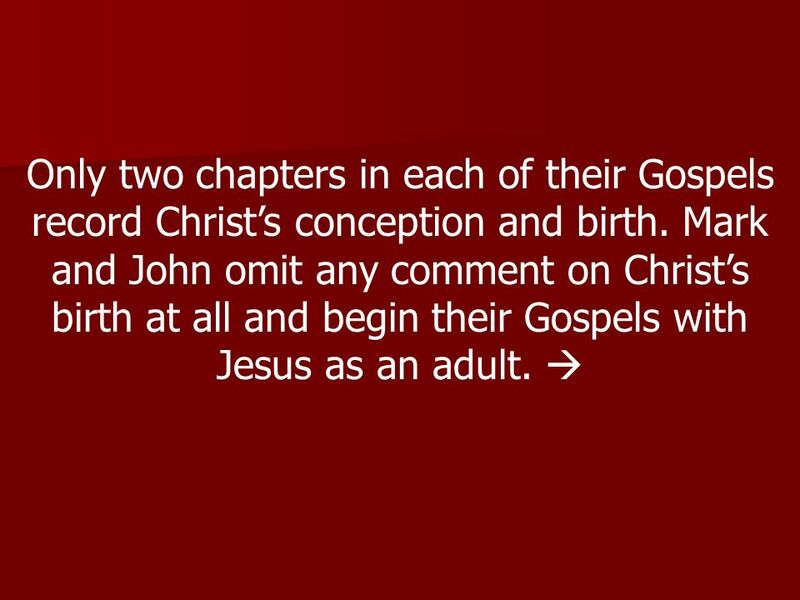 Mark and John omit any comment on Christs birth at all and begin their Gospels with Jesus as an adult. 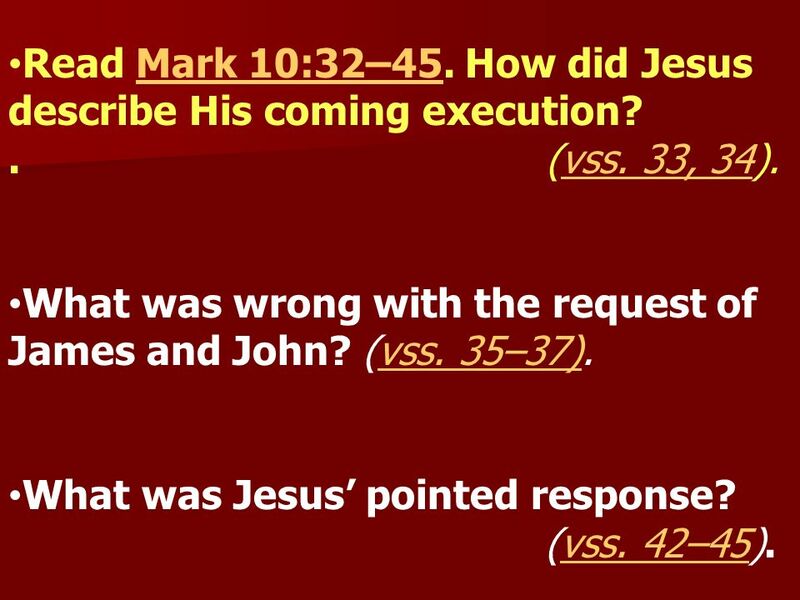 59 All four Gospel writers, however, determinedly emphasize the last week of Christs life and, of course, His death. 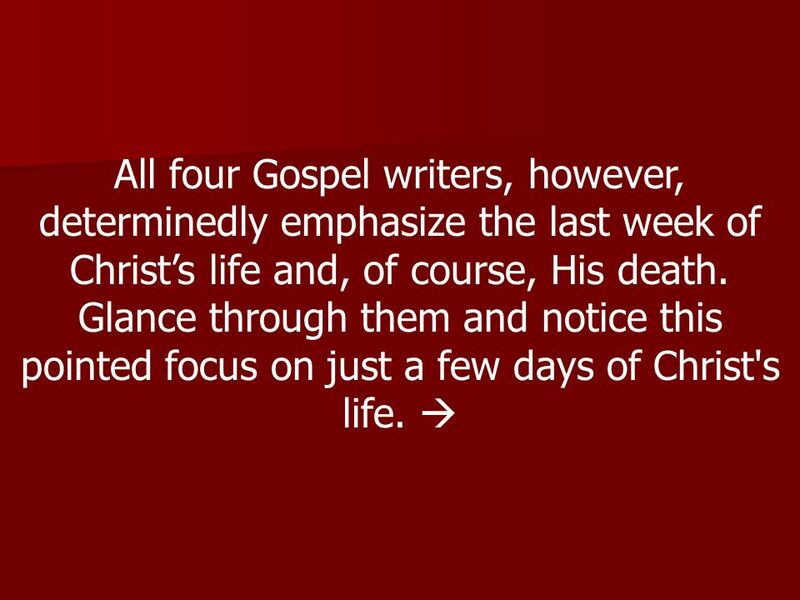 Glance through them and notice this pointed focus on just a few days of Christ's life. 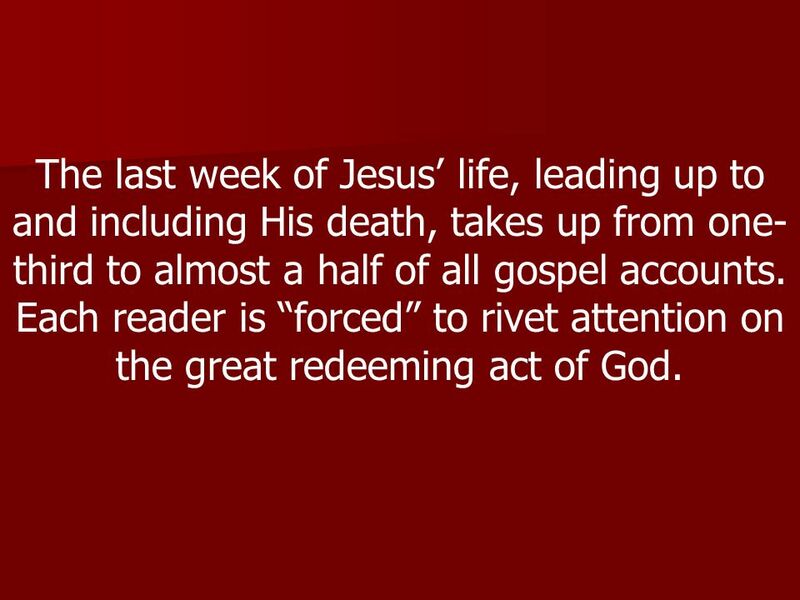 60 The last week of Jesus life, leading up to and including His death, takes up from one- third to almost a half of all gospel accounts. Each reader is forced to rivet attention on the great redeeming act of God. 61 Look at your life, your past, your mistakes, your sins. Do you honestly think anything you have done, or could do, could ever atone for them? Why, then, should the death of Jesus on your behalf be the central focus of your life? What hope would you have without it? 62 Look at your life, your past, your mistakes, your sins. Do you honestly think anything you have done, or could do, could ever atone for them? 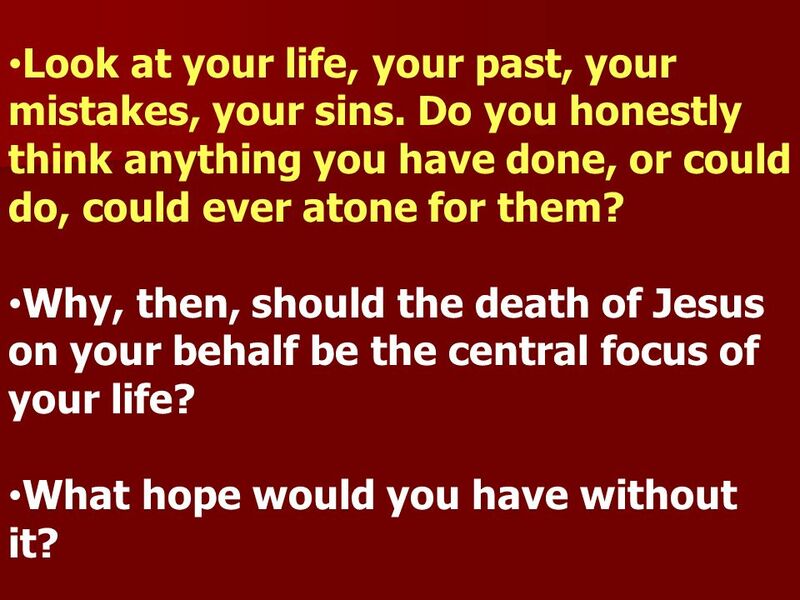 Why, then, should the death of Jesus on your behalf be the central focus of your life? What hope would you have without it? 63 Look at your life, your past, your mistakes, your sins. Do you honestly think anything you have done, or could do, could ever atone for them? Why, then, should the death of Jesus on your behalf be the central focus of your life? What hope would you have without it? 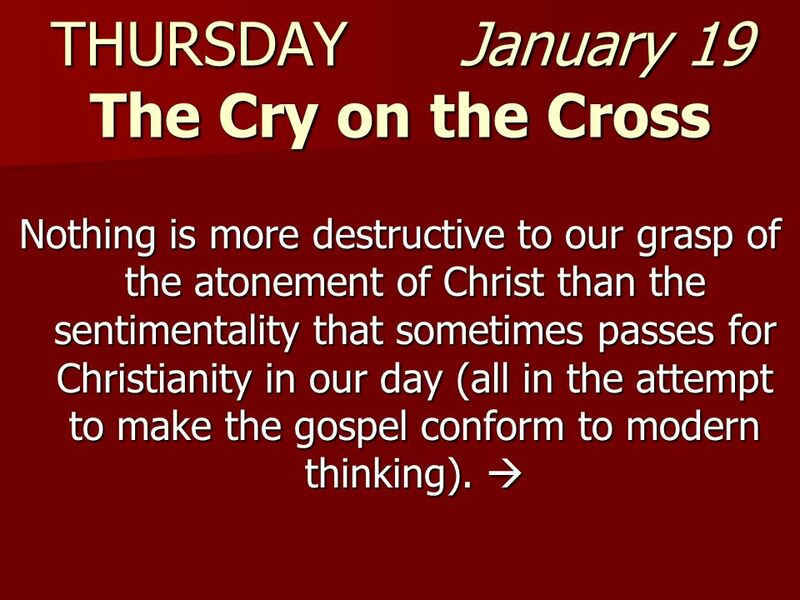 64 THURSDAY January 19 The Cry on the Cross Nothing is more destructive to our grasp of the atonement of Christ than the sentimentality that sometimes passes for Christianity in our day (all in the attempt to make the gospel conform to modern thinking). 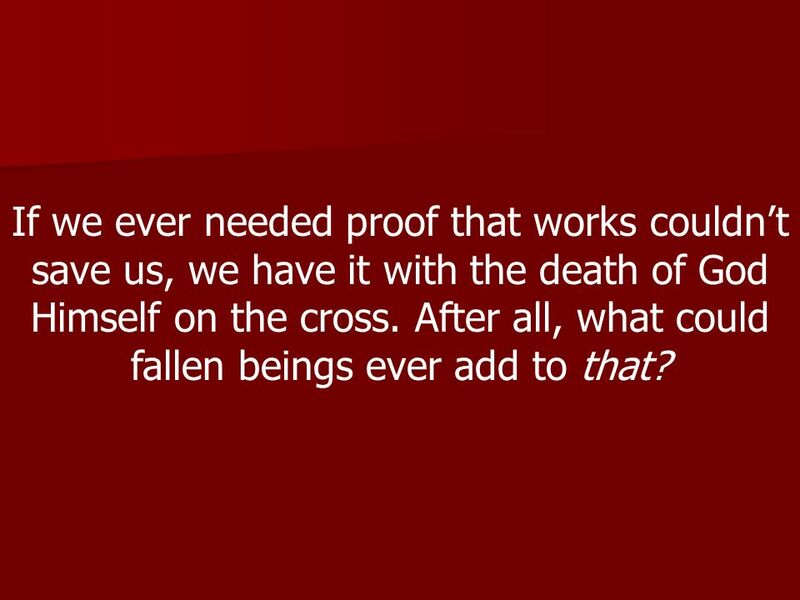 Nothing is more destructive to our grasp of the atonement of Christ than the sentimentality that sometimes passes for Christianity in our day (all in the attempt to make the gospel conform to modern thinking). 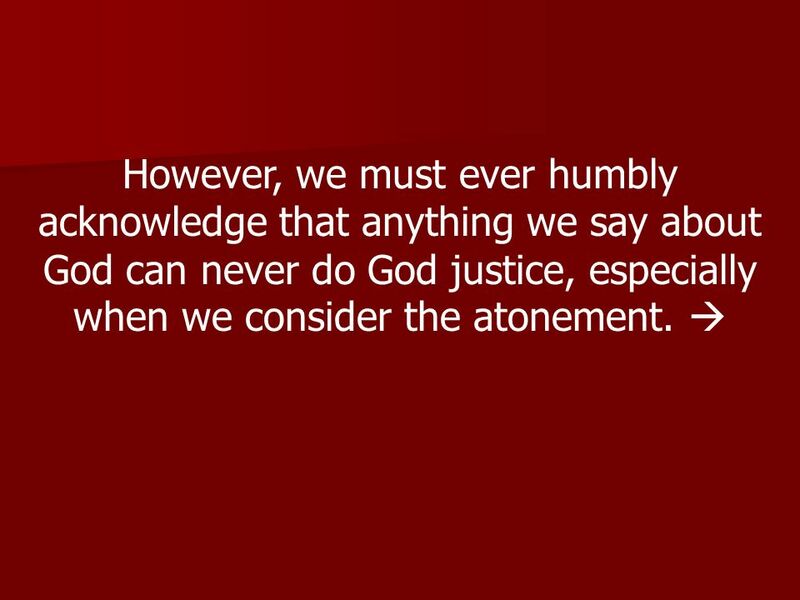 65 However, we must ever humbly acknowledge that anything we say about God can never do God justice, especially when we consider the atonement. 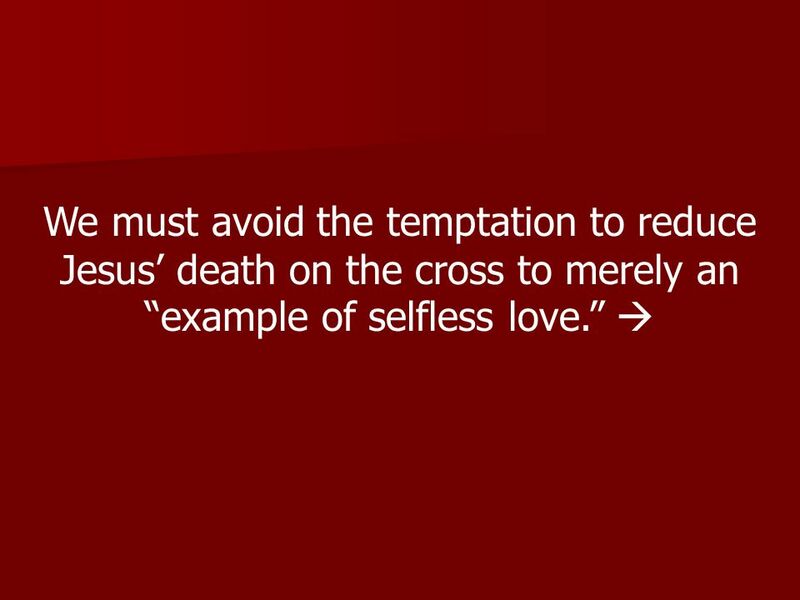 66 We must avoid the temptation to reduce Jesus death on the cross to merely an example of selfless love. 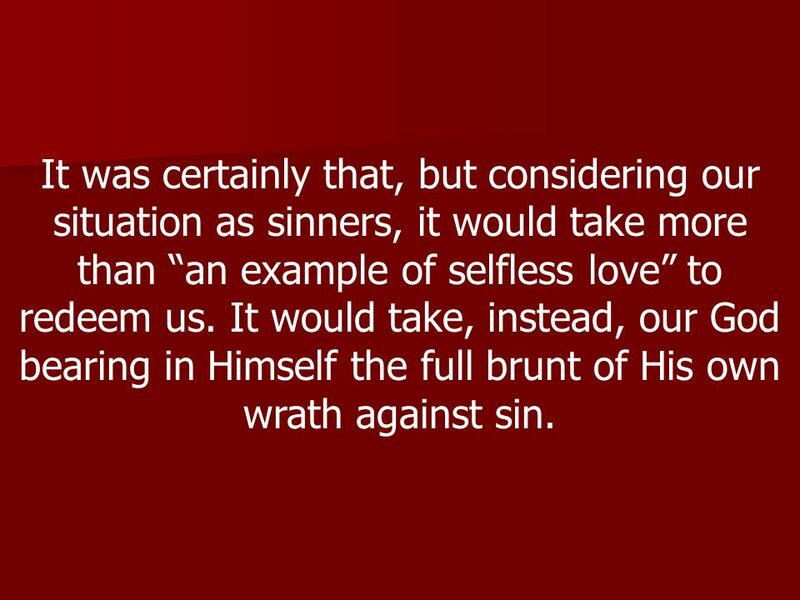 67 It was certainly that, but considering our situation as sinners, it would take more than an example of selfless love to redeem us. 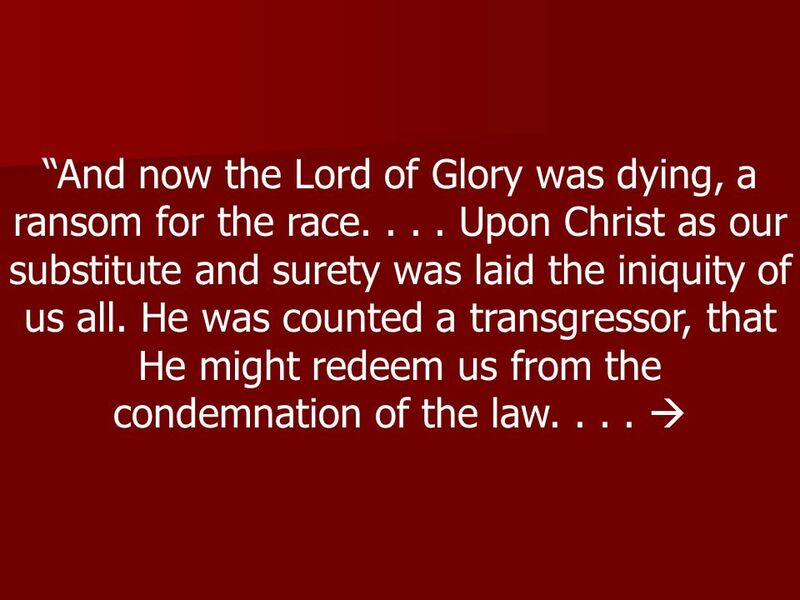 It would take, instead, our God bearing in Himself the full brunt of His own wrath against sin. 68 On the cross, Jesus cried out: My God, My God, why have You forsaken Me? (Matt. 27:46, NKJV).Matt. 27:46 How are we to understand this? What was Jesus saying, why, and how does this amazing cry help us understand what it cost to save us from sin? 69 On the cross, Jesus cried out: My God, My God, why have You forsaken Me? (Matt. 27:46, NKJV).Matt. 27:46 How are we to understand this? 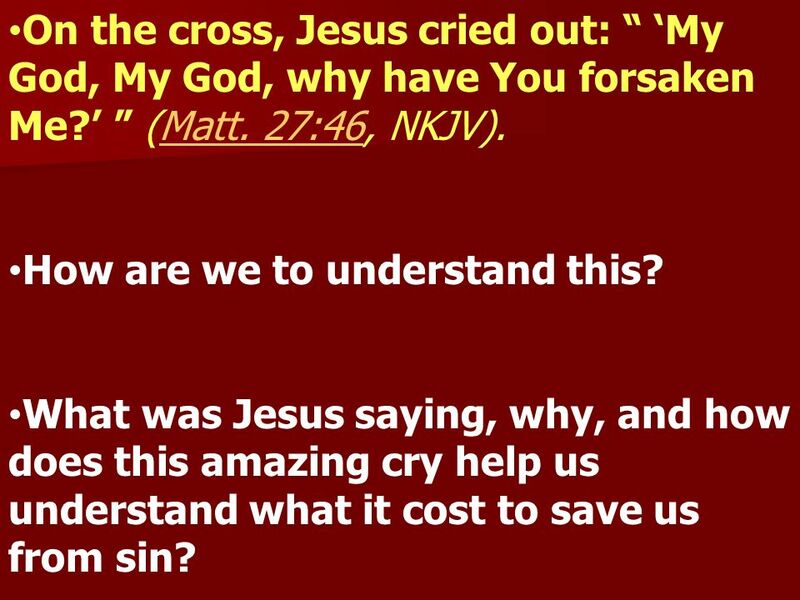 What was Jesus saying, why, and how does this amazing cry help us understand what it cost to save us from sin? 70 On the cross, Jesus cried out: My God, My God, why have You forsaken Me? (Matt. 27:46, NKJV).Matt. 27:46 How are we to understand this? 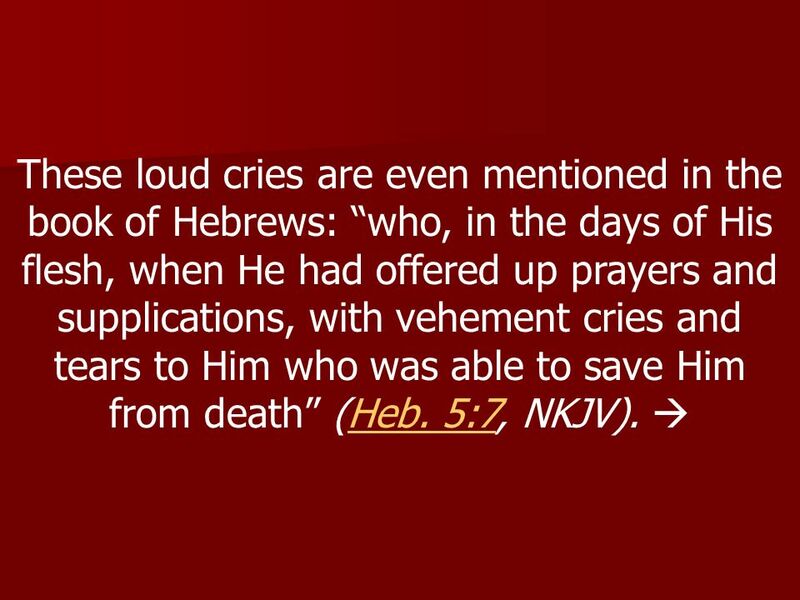 What was Jesus saying, why, and how does this amazing cry help us understand what it cost to save us from sin? 71 On the cross, Jesus cried out: My God, My God, why have You forsaken Me? (Matt. 27:46, NKJV).Matt. 27:46 How are we to understand this? What was Jesus saying, why, and how does this amazing cry help us understand what it cost to save us from sin? 74 Jesus addresses this prayer to God instead of to the Father, as He always had done. 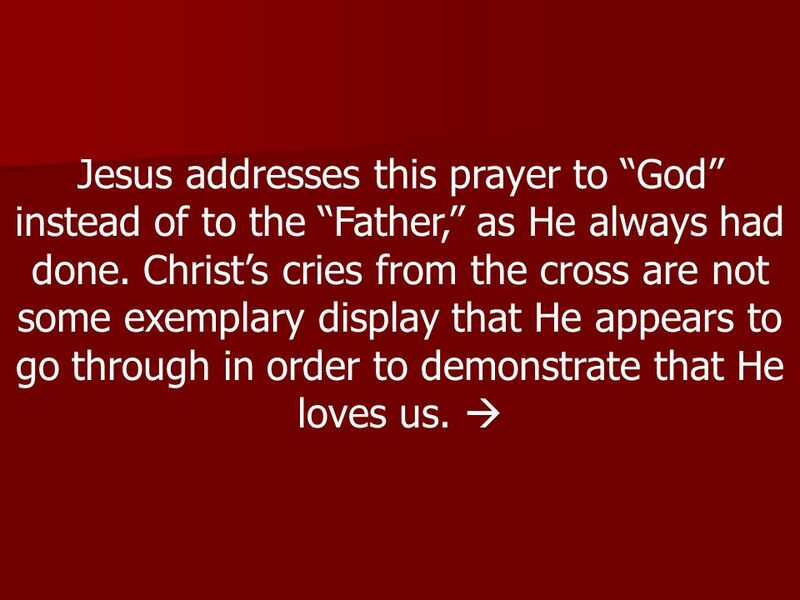 Christs cries from the cross are not some exemplary display that He appears to go through in order to demonstrate that He loves us. 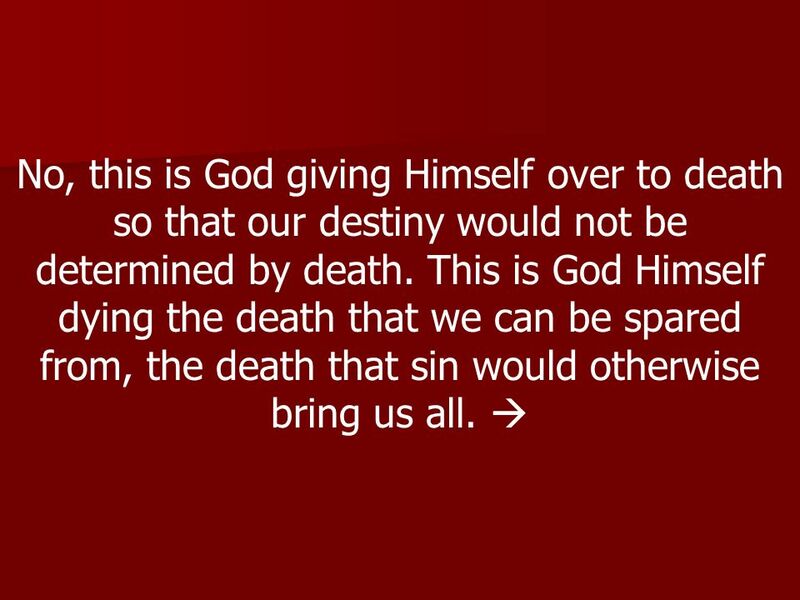 75 No, this is God giving Himself over to death so that our destiny would not be determined by death. This is God Himself dying the death that we can be spared from, the death that sin would otherwise bring us all. 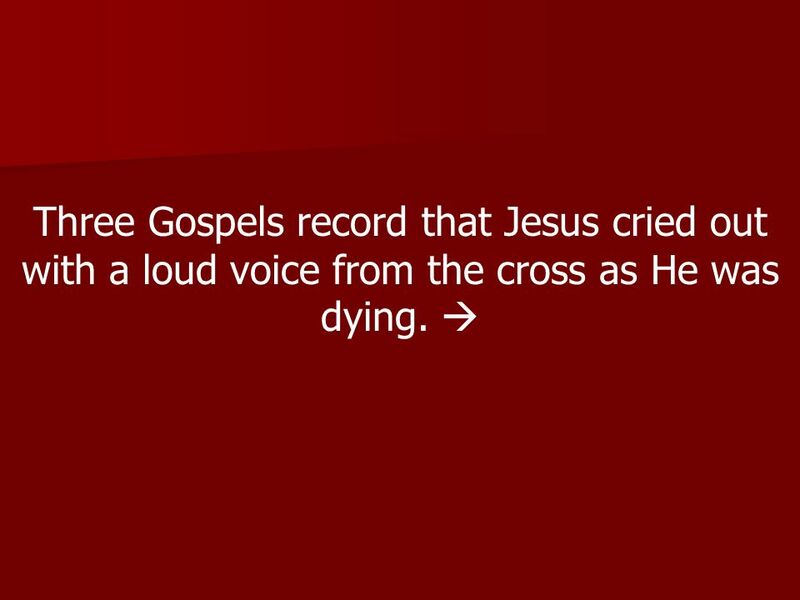 76 Three Gospels record that Jesus cried out with a loud voice from the cross as He was dying. 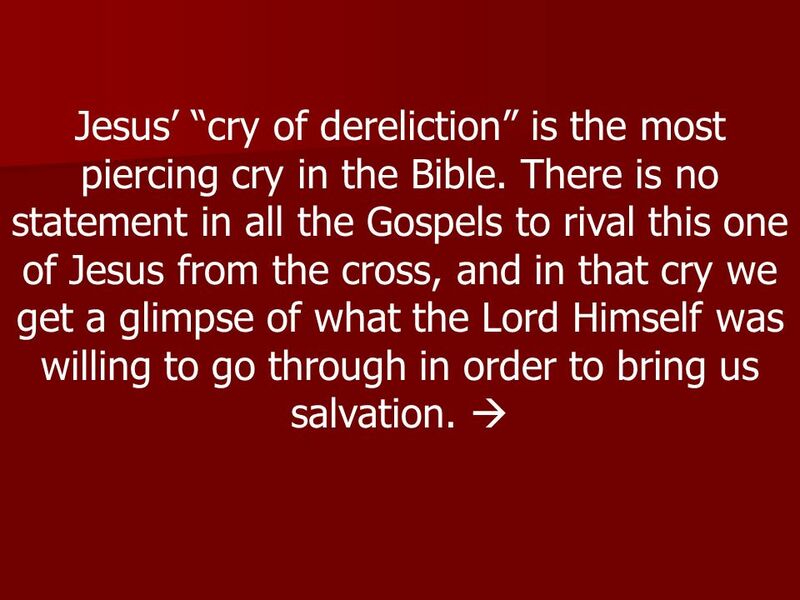 78 Jesus cry of dereliction is the most piercing cry in the Bible. 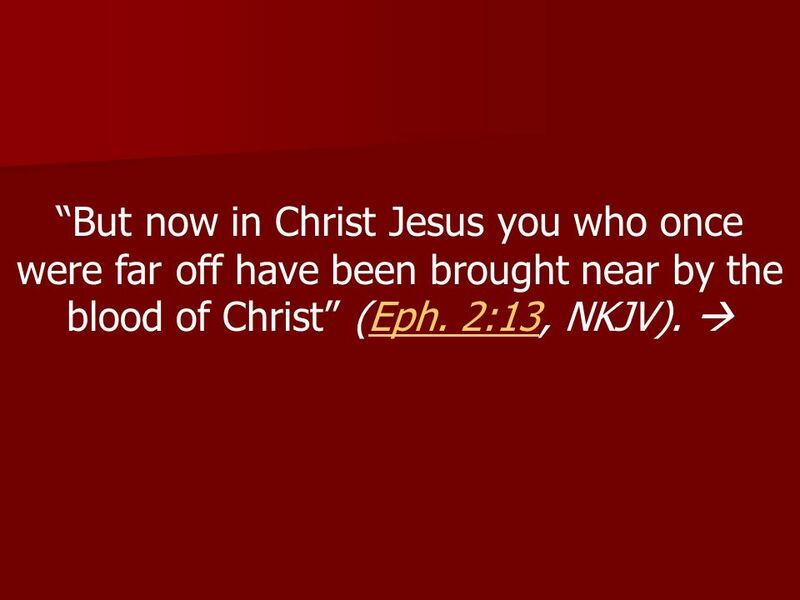 There is no statement in all the Gospels to rival this one of Jesus from the cross, and in that cry we get a glimpse of what the Lord Himself was willing to go through in order to bring us salvation. 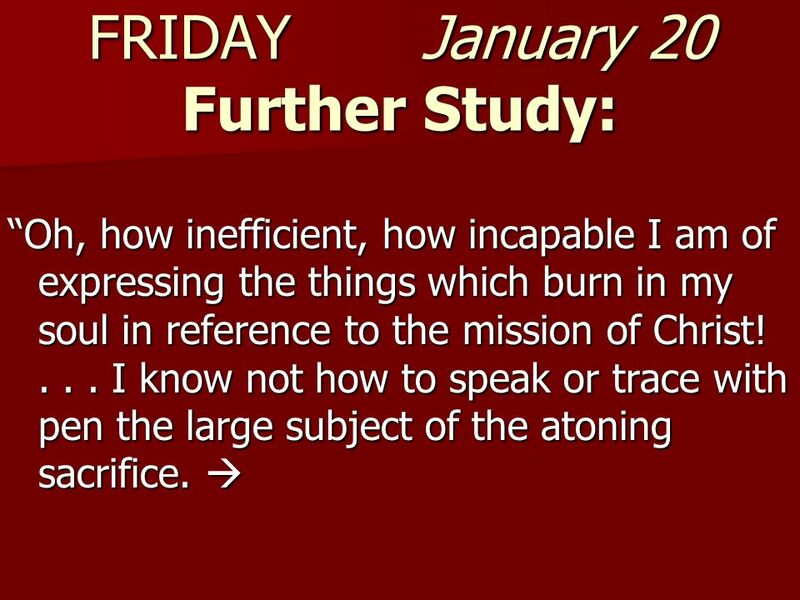 79 FRIDAY January 20 Further Study: Oh, how inefficient, how incapable I am of expressing the things which burn in my soul in reference to the mission of Christ!... I know not how to speak or trace with pen the large subject of the atoning sacrifice. Oh, how inefficient, how incapable I am of expressing the things which burn in my soul in reference to the mission of Christ!... I know not how to speak or trace with pen the large subject of the atoning sacrifice. 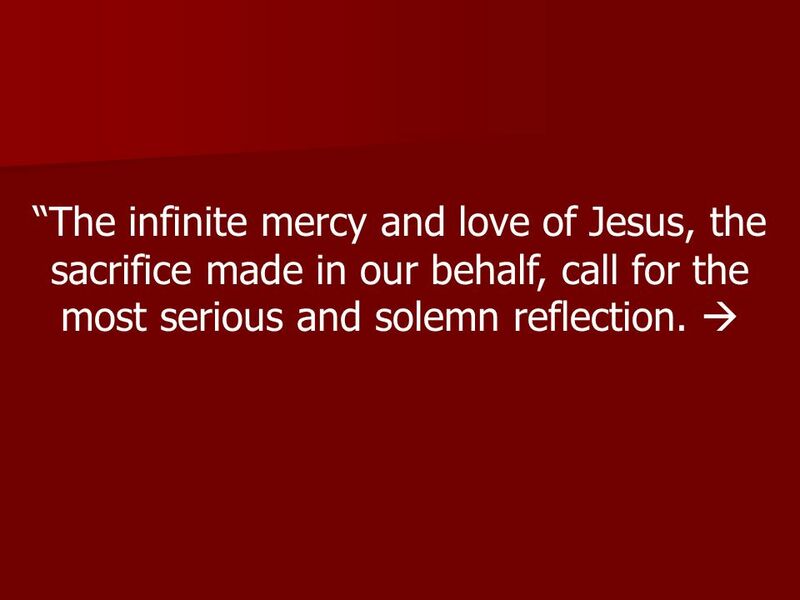 81 The infinite mercy and love of Jesus, the sacrifice made in our behalf, call for the most serious and solemn reflection. 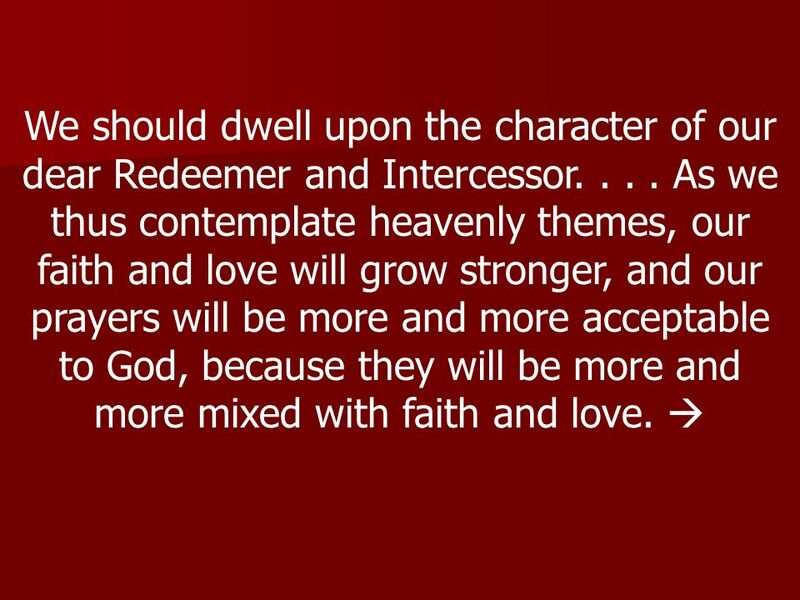 82 We should dwell upon the character of our dear Redeemer and Intercessor.... As we thus contemplate heavenly themes, our faith and love will grow stronger, and our prayers will be more and more acceptable to God, because they will be more and more mixed with faith and love. 84 Discussion Questions: 1. In Scripture God is portrayed both as a great Lover of sinners and also as extremely wrathful against sin. Some Christians try to pick one or the other as representing Gods nature. Why is that unnecessary? In fact, why is Gods love for sinners one of the main reasons why He is wrathful against sin? 85 2. 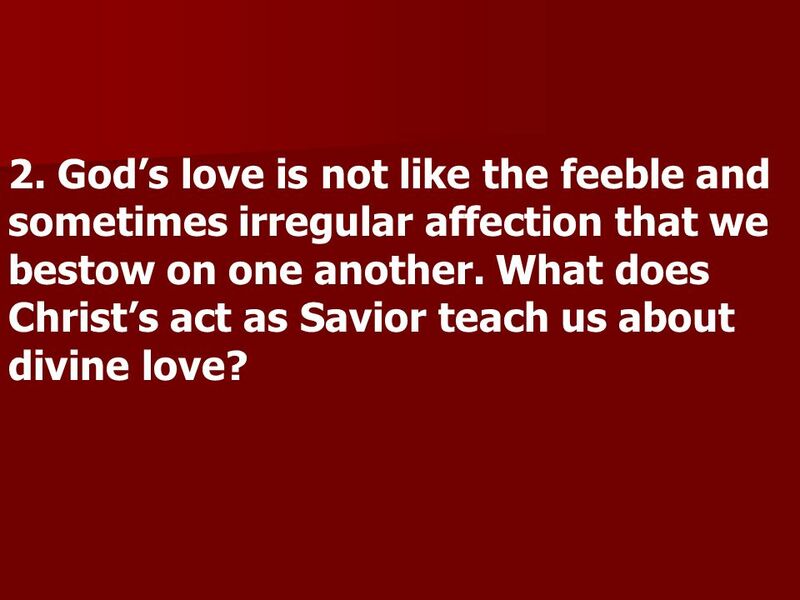 Gods love is not like the feeble and sometimes irregular affection that we bestow on one another. What does Christs act as Savior teach us about divine love? 86 3. 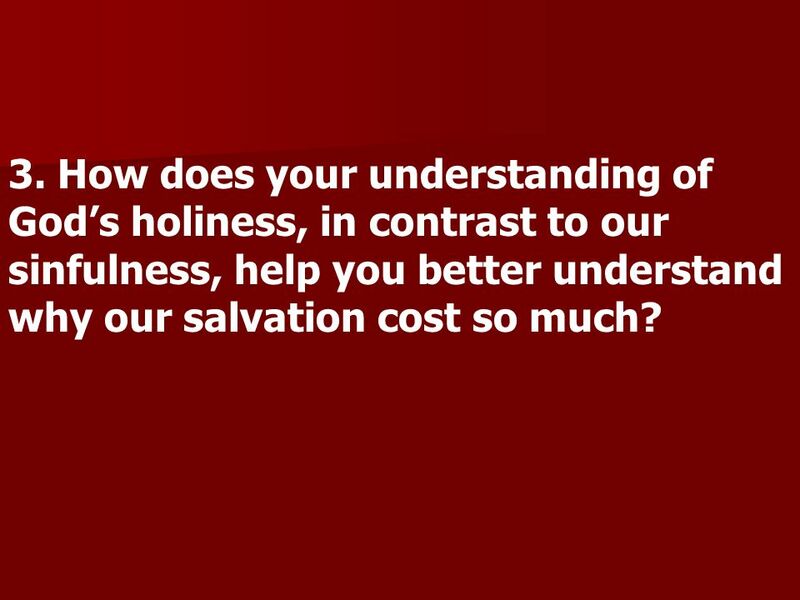 How does your understanding of Gods holiness, in contrast to our sinfulness, help you better understand why our salvation cost so much? 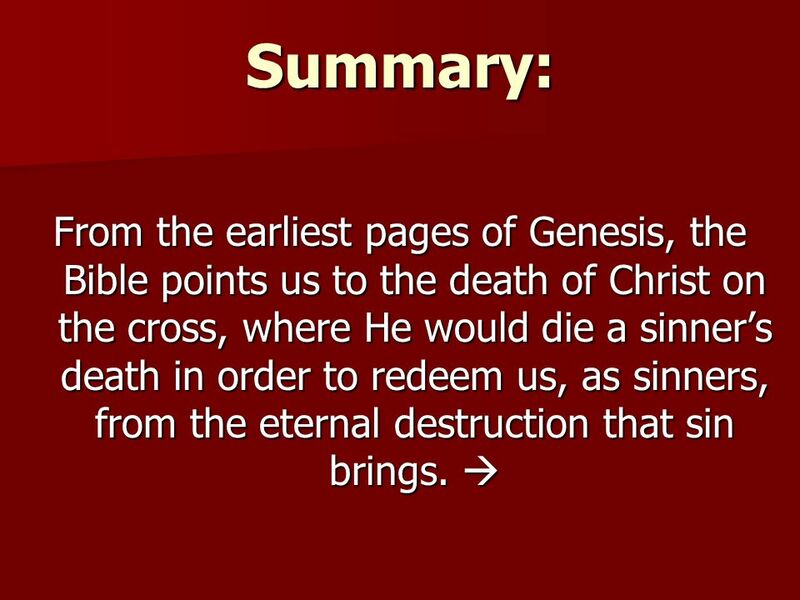 88 Summary: From the earliest pages of Genesis, the Bible points us to the death of Christ on the cross, where He would die a sinners death in order to redeem us, as sinners, from the eternal destruction that sin brings. 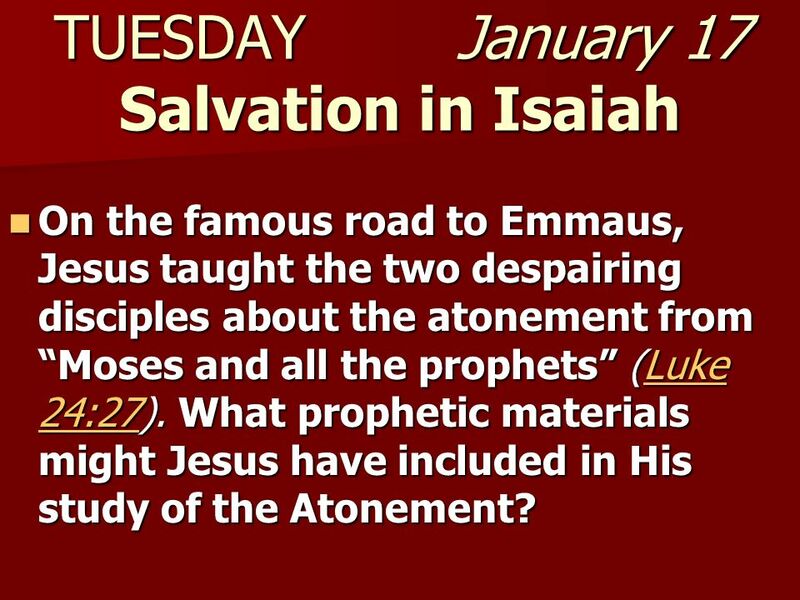 From the earliest pages of Genesis, the Bible points us to the death of Christ on the cross, where He would die a sinners death in order to redeem us, as sinners, from the eternal destruction that sin brings. 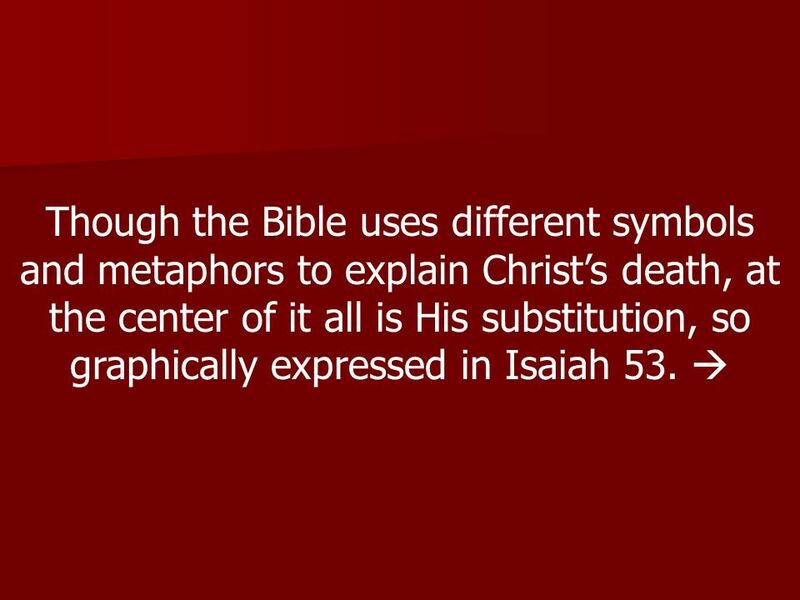 89 Though the Bible uses different symbols and metaphors to explain Christs death, at the center of it all is His substitution, so graphically expressed in Isaiah 53. 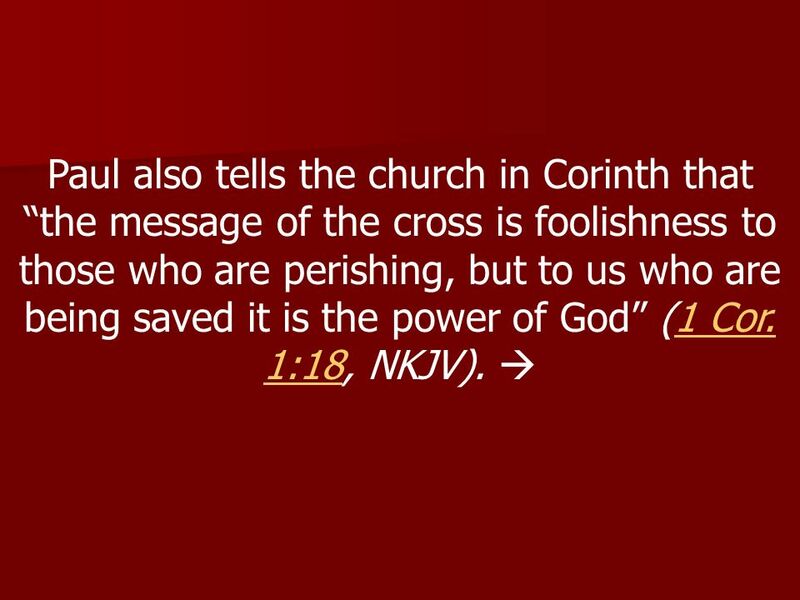 90 If we ever needed proof that works couldnt save us, we have it with the death of God Himself on the cross. After all, what could fallen beings ever add to that? 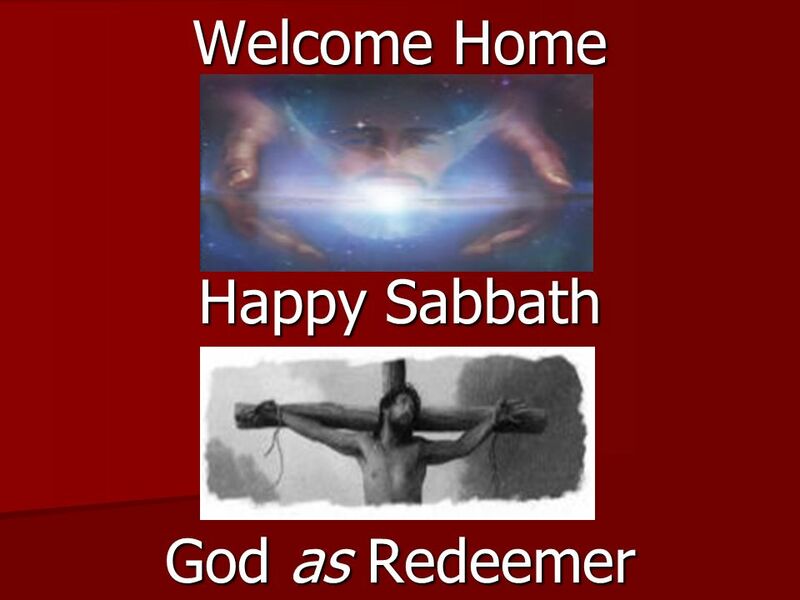 Download ppt "Welcome Home Happy Sabbath God as Redeemer. 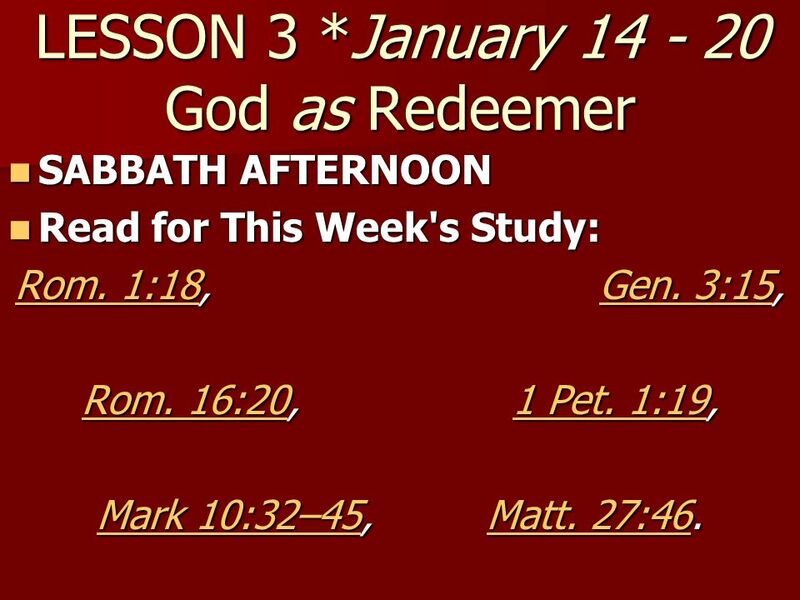 LESSON 3 *January 14 - 20 God as Redeemer SABBATH AFTERNOON SABBATH AFTERNOON Read for This Week's Study:"
We See Jesus – Part I We See Jesus – Part I Pg 1062 In Church Bibles Hebrews 2:9-13 Hebrews 2:9-13. The Grace Of God Imputation Or Forgiveness?. We believe the scriptures teach that man was created in holiness, under the law of his maker; but by voluntary. - Glenn Kenadjian. This retreat is a time to relax and have fun Its also a time where we can reflect on some of lifes big issues Where are we to go, and. 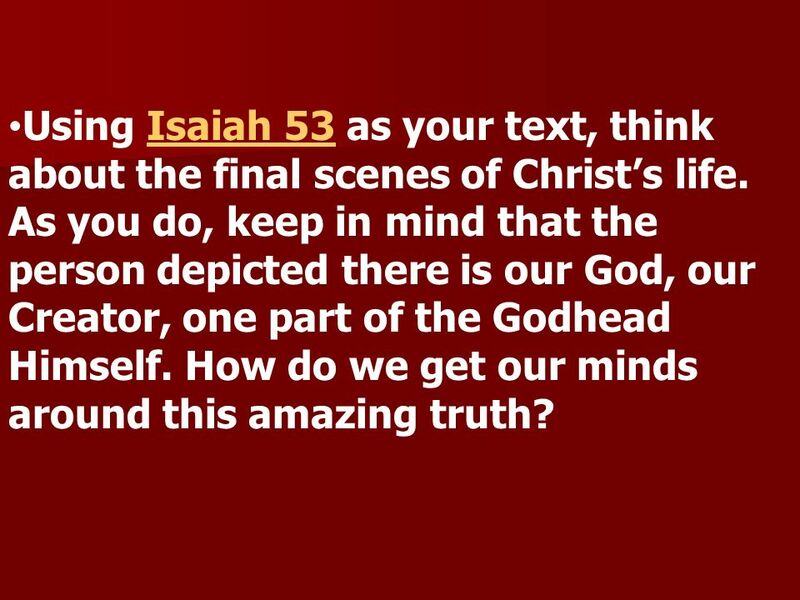 The Big Picture of the Bible part 5 Assistance from the book written by Kenneth W. Craig. Being Ashamed of Jesus -Welcome to Ashley Heights Church of Christ. THE FEAST OF THE CROSS. Feast of the Cross Tut 17 Tut 17 –(September 27) –Feast of the appearance of the Cross to Empress Helena (4 th century) –Day of. Saving The Sinner James 5:19-20.